At around $1200 U.S. this Ariens Deluxe 28 SHO is an affordable heavy-duty snow blower. If you are considering the Ariens Snow Removal Deluxe 28 in. Two-Stage Electric Start Gas Snow Blower with Auto-Turn Steering 921030 but feel you may want a little more power this is the best choice for you. Ariens lets me borrow one or two models every year for MovingSnow to review. Last year it was the Platinum 30 SHO and a Power Brush. This year I asked them to send only one and they sent the new Ariens Deluxe 28 SHO Model 921044, 28 inch, 306 cc snow blower. My local dealer Barstow Street Auto Service set up and delivered this snow blower. One of the best selling points of the Ariens is they just look good. Large metal chute, big tires, rolled front lip on the blower housing. 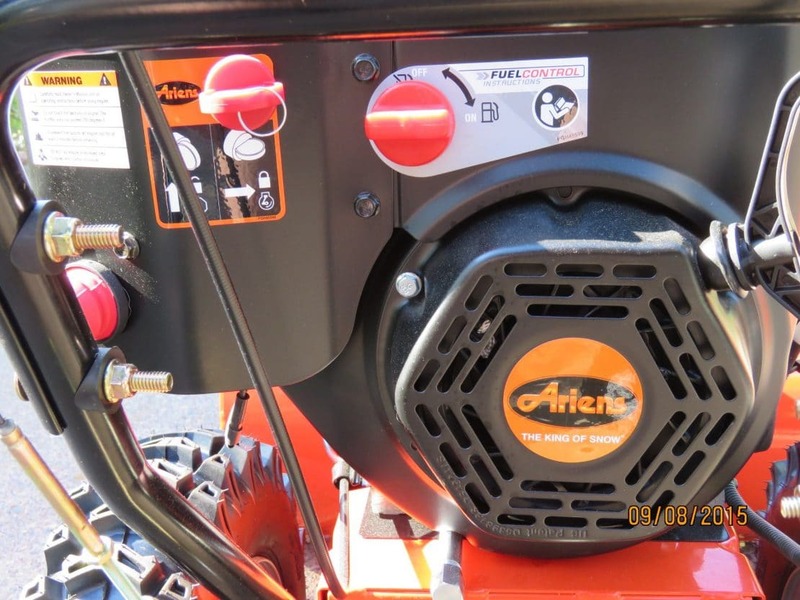 The Ariens orange is a heavy duty powder coat that is baked on for long life. Just the high visibility color makes me want one when I’m cleaning near the end of my driveway. Right Front View. 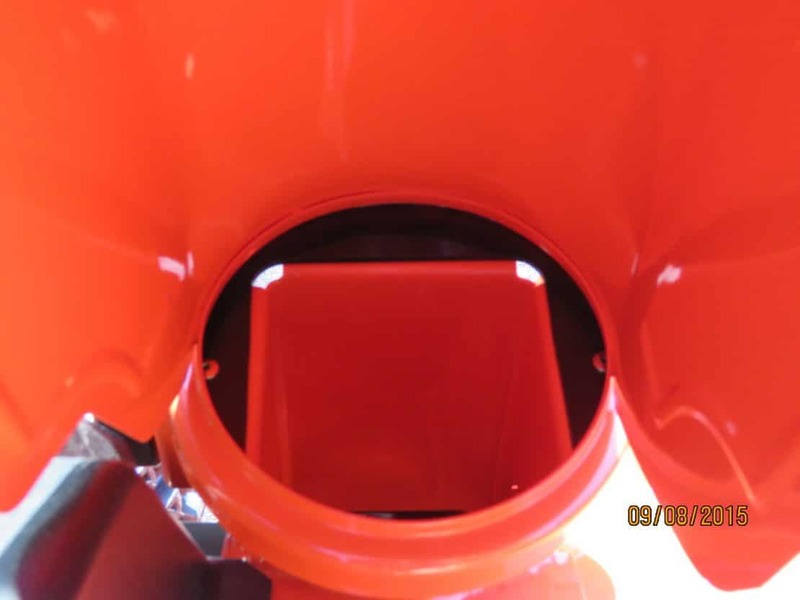 The 28 inch front housing (bucket) is 21 inches high. This allows you to clear deeper drifts than your old snow blower. The traction and blower levers appear to be just a little longer this year. When you push them down they now come all the way to the end of the handles. I like this feature because I tend to hold on to the handles by the very end. Can you guess what the other snow blower is in the picture? Right Rear View. Everything about this snow blower screams heavy duty. Even the control cables and rods are thicker than any other brand’s. View from the operator’s “seat.” This Ariens has a nice clear view of what’s going on up front. The large discharge chute doesn’t get in the way of your view. Ok, let’s get started on the features. The Ariens AX 306 cc is a premium engine designed to give you longer life than the engine on your old snow blower. In the picture you can see the easy to use Fuel Shutoff and Key Switch. Other brands use an on-off switch and a separate safety key but the Ariens simplifies this by using a removable ignition key. This key is the on-off switch and you can remove it for safety when you are not using the snow blower. There is a separate button for the electric start. Snow Blower engine power ratings have been confusing. Some brands only label cc’s. 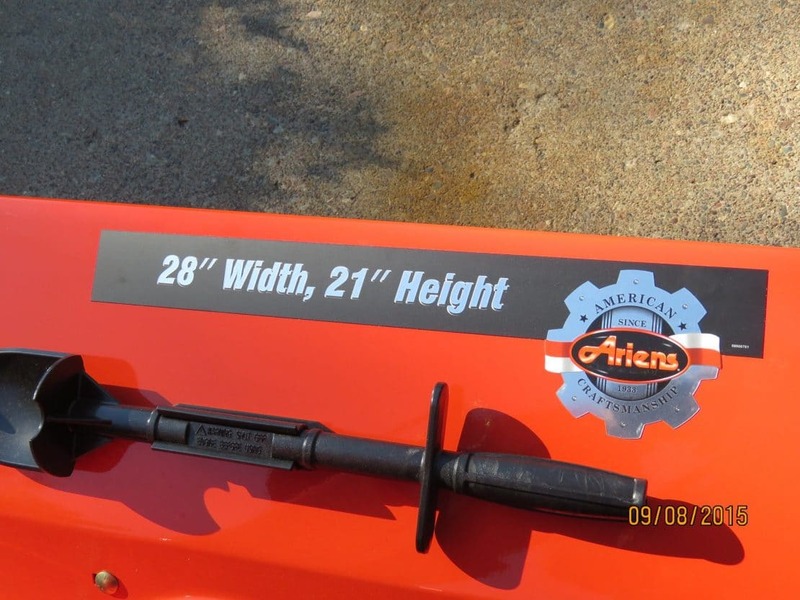 Ariens uses this conservative measurement so you always get the power you expect. This rating is now consistent but lower than labeling used before 2012. The engine still produces the same amount of power. The Ariens AX engines are designed to run on unleaded fuel up to E10 (10%) ethanol blends. 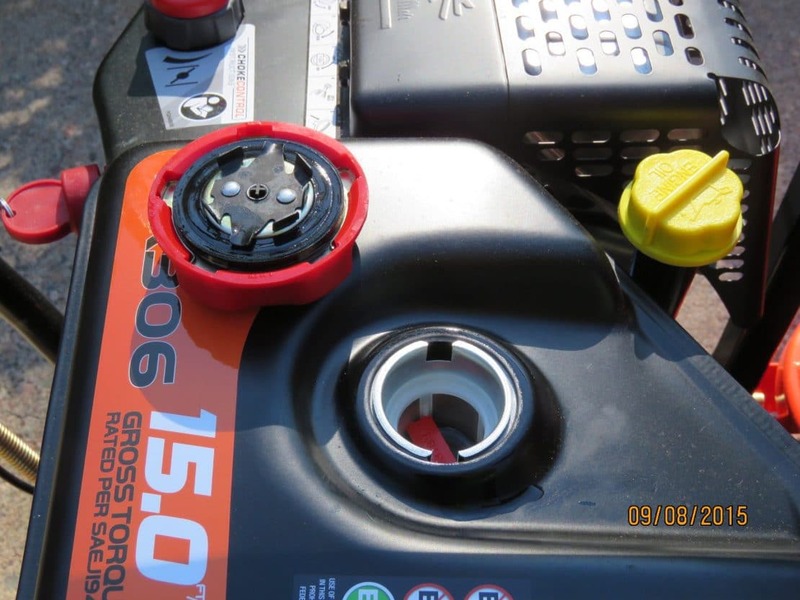 NEVER USE E15 or E85 fuels in a small gas engine like this one. E15 is only used in new autos. 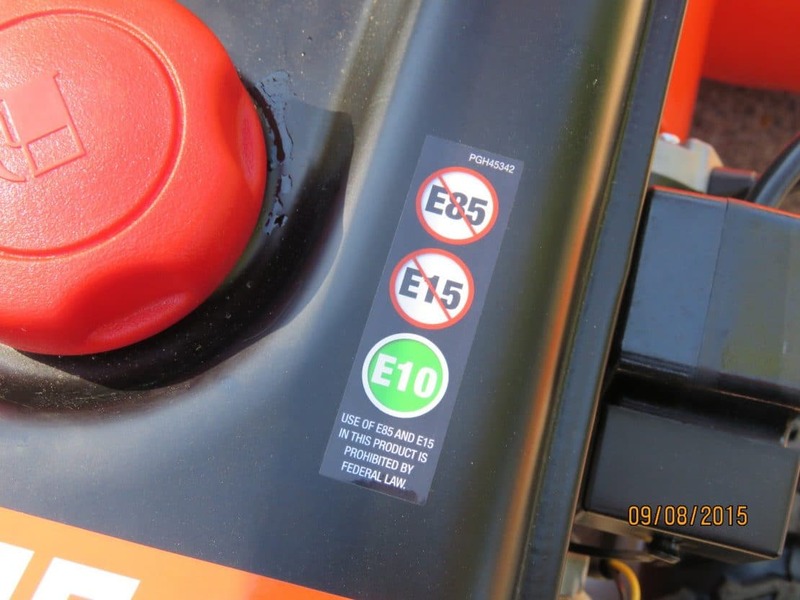 E15 fuel will ruin your snow blower engine and that failure is not covered by any warranty. Many areas of the country now offer all three fuels at the same pump so double-check to make sure you are getting the E10 blend. 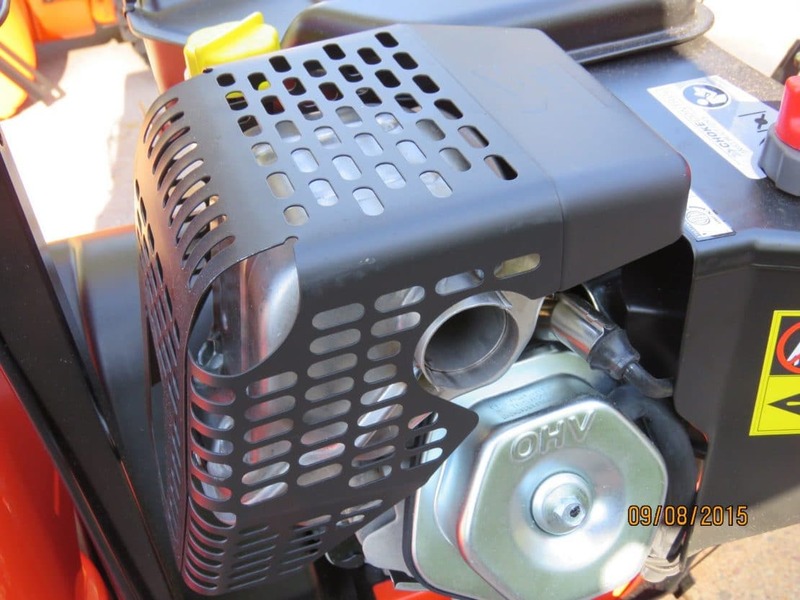 Ariens uses the quick cap on their version of the LCT engine. I like it better than the ratchet cap but you may find you will have to take your glove off to loosen it. Easy To Use Rear Oil Drain. No need to spill oil all over a tire when changing oil! Speaking of oil. Another brand has eliminated the oil dipstick. (To save costs?) 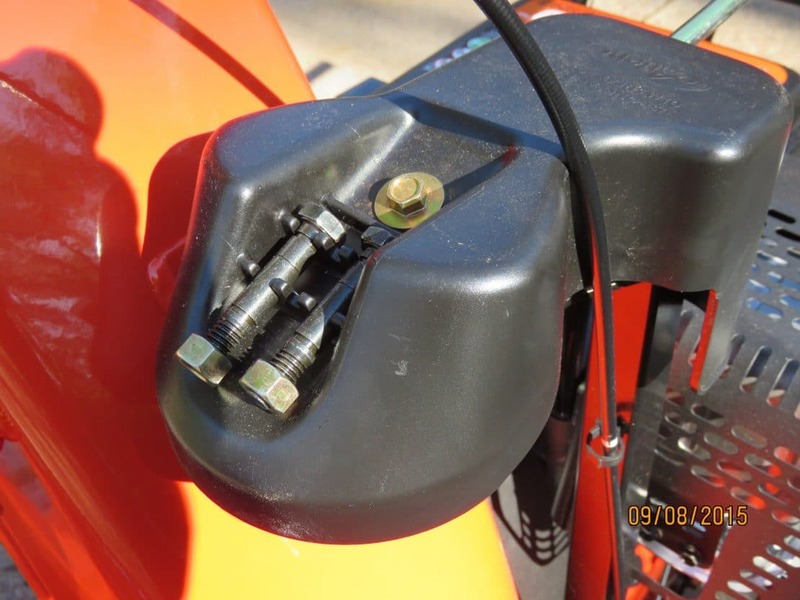 On that model you have to use the secondary fill cap to check the oil. 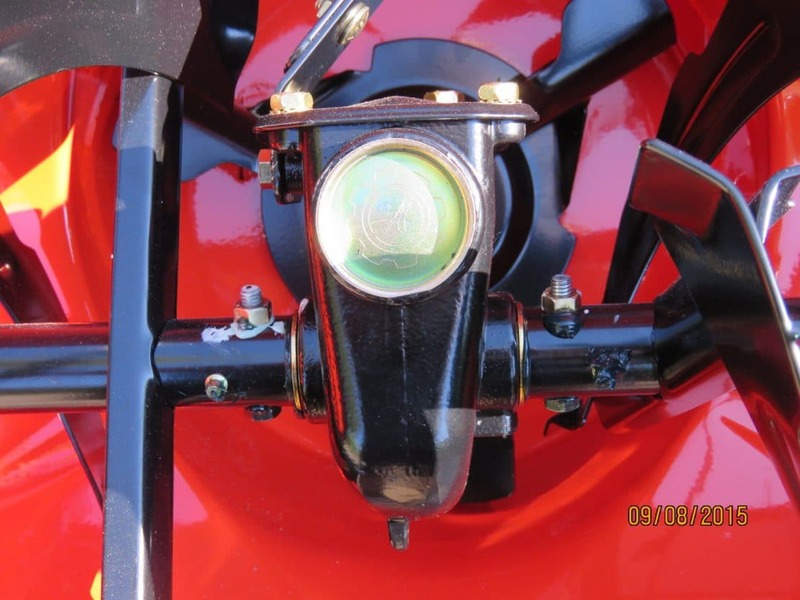 The Ariens AX engines use the easy to read dipstick. The Low Tone muffler is quieter than the ones put on snow blowers 10 years ago. I still suggest you use hearing protection (or earmuffs) to protect your hearing. Moving on to the dash or console. Ariens redesigned the dash this year to make it easier to read and consistent across all the models. The diagrams are easy to understand and large enough so I can see them without my reading glasses. The freehand control is on the left on Ariens snow blowers. What that means is if you are out blowing snow you can take your right hand off the blower lever and use it to change the chute and deflector position. I really like the new gear selector! The specs state this is a 6 forward – 2 reverse but take a close look at the picture. There are 2 reverse speed, 5 forward speed and the 6th “transport” speed. If you have to go over to the neighbors to clear their drive just put it in the 6th gear and “RUN” over there! Just one more thing about the Ariens transmission. 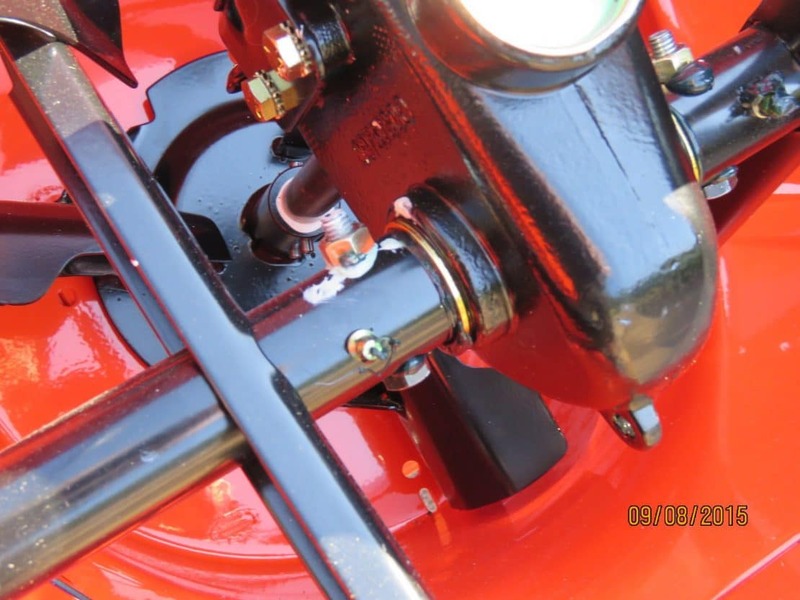 Do you know why you never hear of anyone repairing the transmission or friction drive on the newer Ariens? The reason is when you release the drive control on the left handlebar the transmission completely disengages. 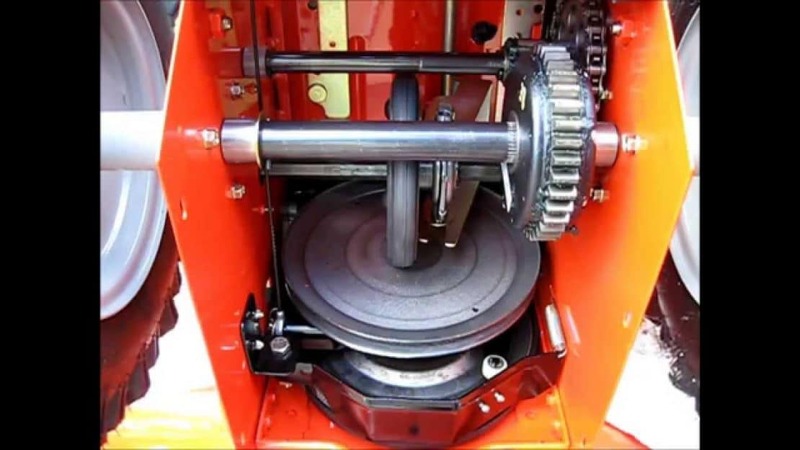 The friction disk inside the transmission is released from the drive plate which keeps it from getting flat spot on the rubber face of the disk. This is also why you can freely move the transmission lever on the dash when the snow blower is not running. A look inside the Ariens Transmission. Strength and Simplicity! One last item about the new dash. The controls are now all nice and big. Very easy to hold with gloved hands! On to the chute! The chute is all metal and the discharge area of the impeller is also metal. Ariens uses a thicker steel here so rocks and gravel don’t wear holes over the years. 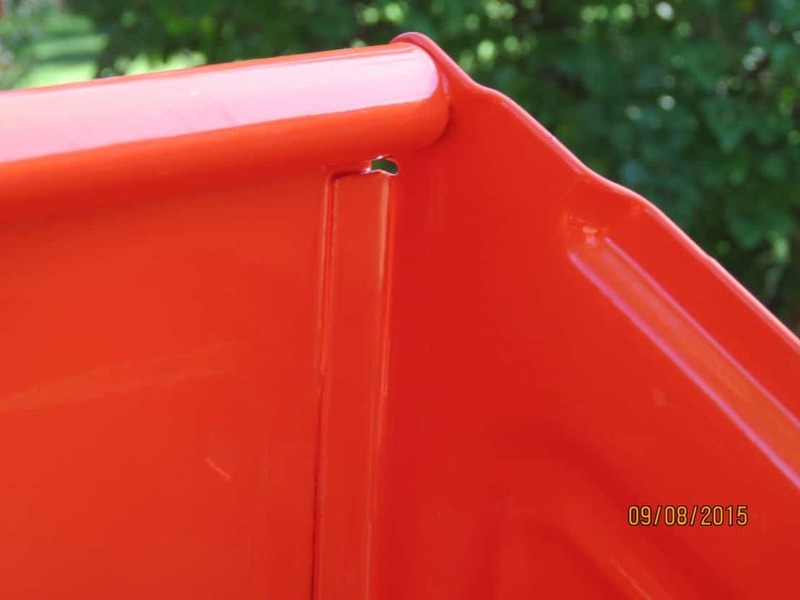 There is only one poly piece in the Ariens chute. This “bearing” keeps everything turning smoothly. You don’t need to grease your chute anymore! The chute is wider than the discharge. This is one of the features that keeps the chute from clogging when blowing wet snow. That black strip you see is a rubber piece that keeps snow from blowing back through the hinge when the deflector is all the way down. I’ve owned snow blowers that didn’t have that strip and is was very aggravating when snow blew back on the hot muffler/engine everything started to freeze up. Even though I have never broke a shear pin on an Ariens snow blower the new models like this one have a set conveniently located on the chute control gearbox. Almost done – Only 15 more pictures to go 🙂 The Ariens Deluxe models use large 16 inch deep lug tires. They are narrow which lets them cut into the snow and hard packed ice easily. You don’t need chains for these superior tires but Ariens does have optional chains available if you really need them. 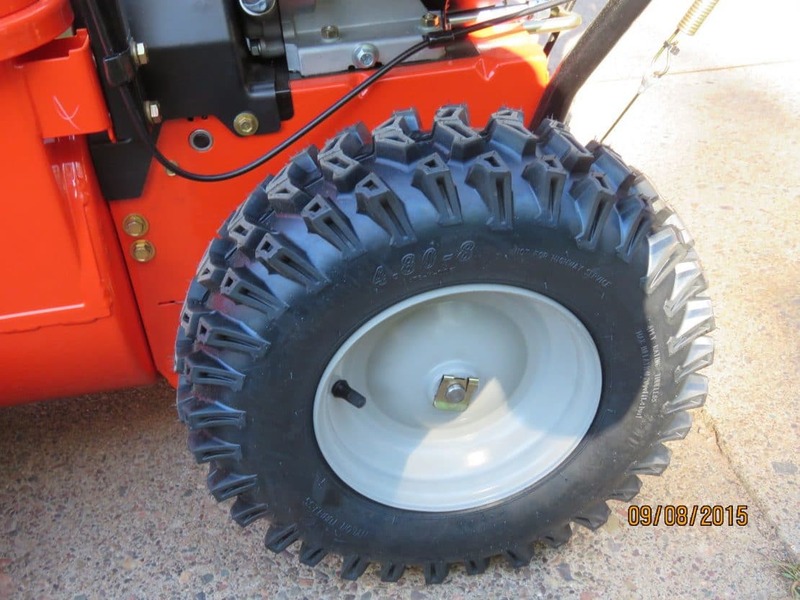 Buy the way if your snow blower wants to wander to one side all the time – check the tire inflation. One will need some air. It’s the little things that make the Ariens one of the best snow blowers on the market. Solid rust resistant springs, heavy cables and cast eyelets make the cables much stronger than the ones on other brands. The little touches like cable tie “safety wire” to make sure things never fall off. Keepers on the cable pulley so if the cable does stretch it won’t fall off the pulley. Yes, The Ariens comes with the required safety chute cleaning tool. If you ever do clog up your Ariens remember it’s there and PLEASE use it to clean inside the chute and the auger housing! In the U.S. alone we have dozens of people lose fingers because they didn’t use the clean out tool and the impeller cut their fingers off. Remember even with the engine shut off there may be enough tension on the impeller for it to turn and snap a finger. Ok, we are almost to the front of the snow blower! The standard skid shoes are heavy-duty long life steel. I expect them to last 3 to 4 times longer than the steel shoes on your old Murray. Plus they are reversible. 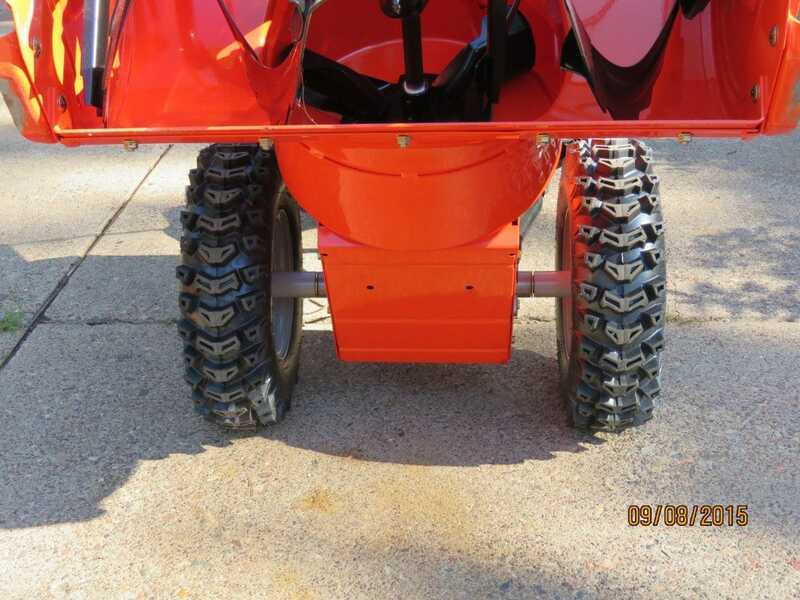 Ariens Optional Poly Skid Shoes. Look at the size of these shoes! One inch wide and made of a long wearing poly. My front cement driveway is very rough and these poly shoes really help me to turn the snow blowers easily. I’ve gotten to the point where I change out the metal shoes for these right away. They are wider than the steel version so they also work well on gravel. Finally, we made it to the front. working part of the snow blower. Another of the little things that makes the Ariens special. The top lip of the auger housing is rolled. The primary reason is for strength but it also makes it very nice to lift the front end of the snow blower to inspect it or change a shear pin. Most brands use two bolts to hold the auger bearings. Ariens uses three. 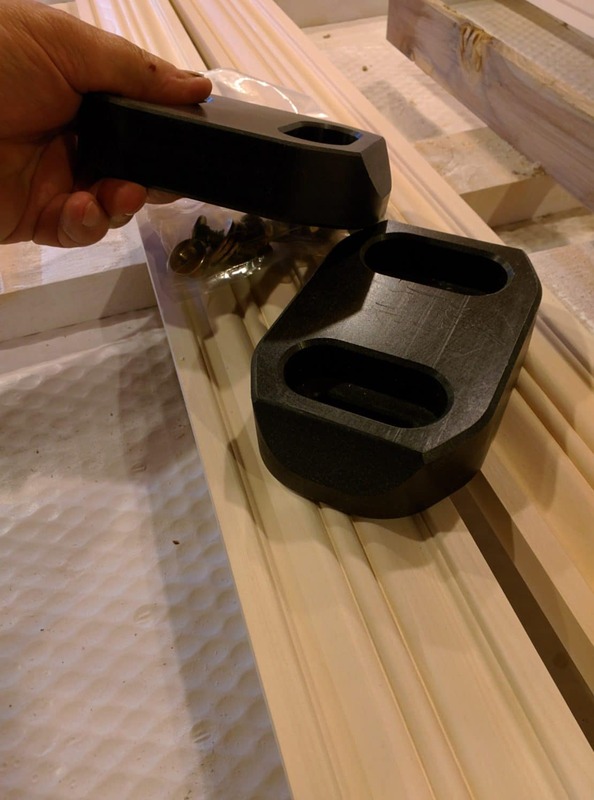 The replaceable scraper bar is not only bolted across the bottom but has two additional side bolts to keep it from bending or warping over time. The legendary Ariens cast iron gearbox. This gear case is so heavy duty it was originally used in a roto-tiller! I’ve used many snow blowers over the years that did not use a center brace. Over time the front auger would sag or bend from hitting “stuff” and the auger would bounce up and down as it rotated. This quickly tore out the side bearing and even the center gearbox. 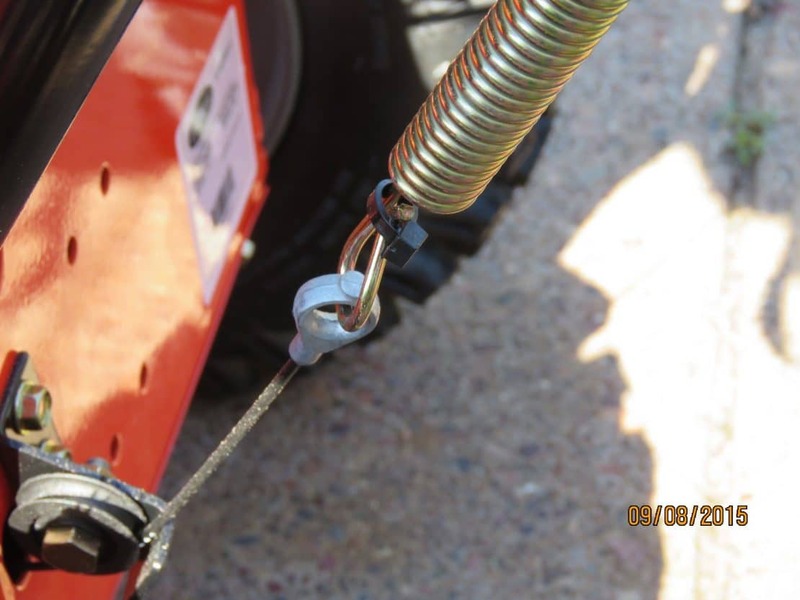 The Ariens gear box is not only the strongest but is additionally reinforced with these brackets so the front auger will never start to wobble. Smooth metal undercarriage. This creates a better and more slippery airflow which increases fuel economy and decreases wind resistance – Just Kidding! At least it won’t crack and fall off over time like the plastic ones do. Last but not least! 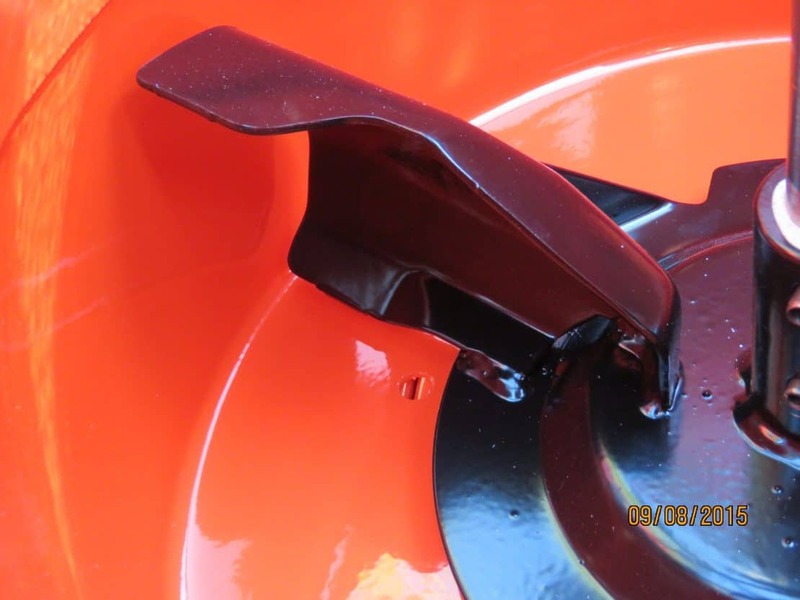 The specially designed SHO impeller paddles are made to efficiently and effectively move snow. 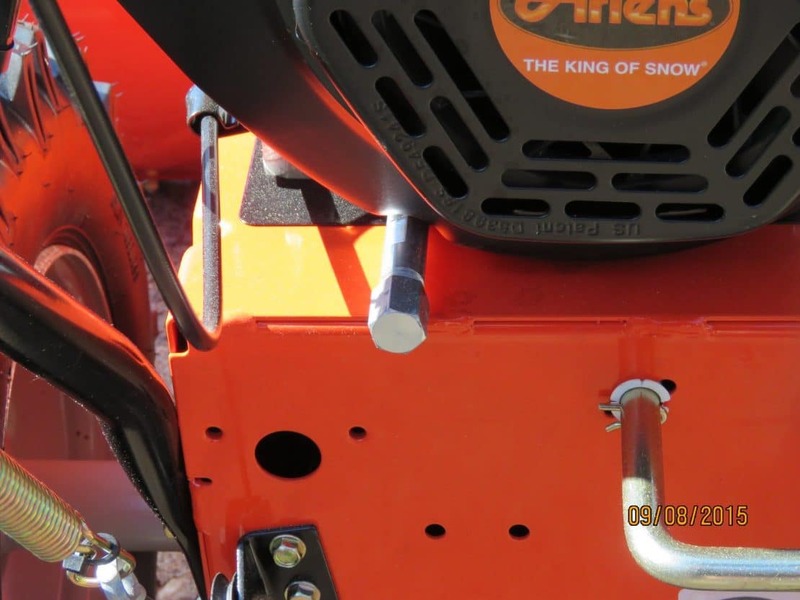 In addition the cupped design allows you to throw snow farther than most other snow blowers on the market. Someday I would like to take the four high-end snow blowers into the same field of snow and see which one actually throws snow the farthest. I’ll bet you a tube of lithium grease for your grease gun that this impeller will finish first or second. That’s it for this review! Feel free to ask any questions you may have in the comments below. 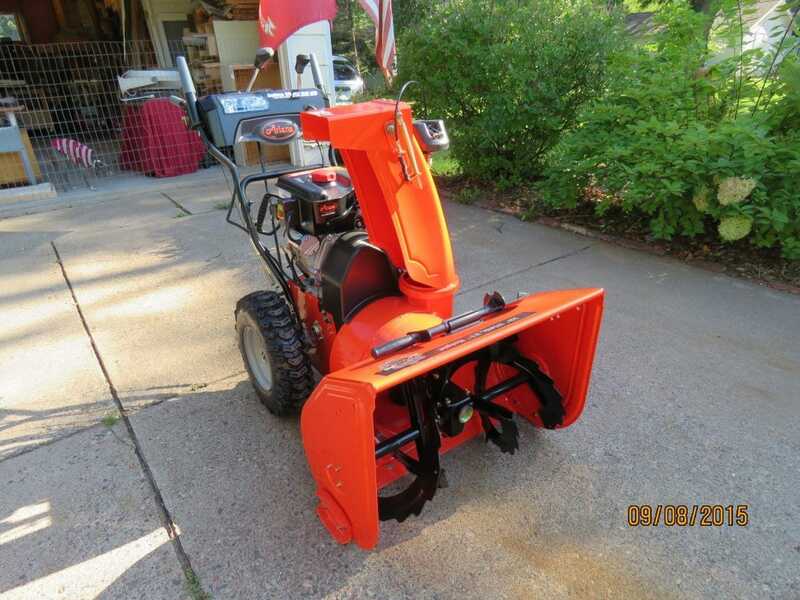 You can only get this snow blower through an authorized Ariens Dealer. Ariens Dealer Locator. Troy-Bilt Storm Tracker 2890 Track Review – A Good Snow Blower At A Great Price! 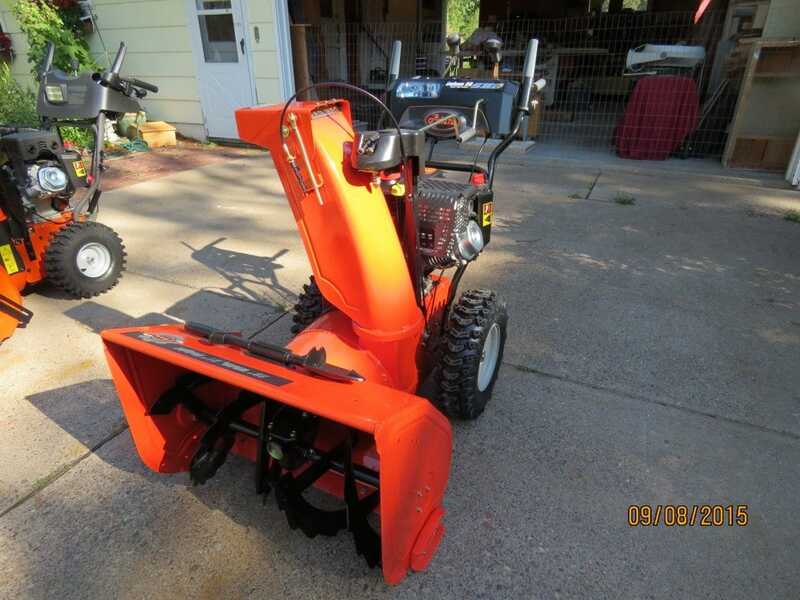 I’m in the market for a new snow blower and I can’t decide between the Husqvarna st327p and the Ariens delux 28 SHO. I read both of your reviews and they seem great machines. Out of the two which one would buy? Hi Emil, Yes, they are both good machines. It’s a tough choice. For the price, I would buy the Ariens Deluxe SHO. If I felt I needed a hydrostatic transmission I would buy the Husqvarna. If I had a long straight driveway the Husqvarna which uses triggers on the handlebars to steer would be a better choice. It would go in a straight line all by itself. The Ariens with the AutoTurn really shines if you have a shorter driveway, a curved driveway, or a lot of smaller areas to clear. The auto turn steering is effortless and you don’t need to remember which trigger to pull. You just move the handlebars and it turns. The Husqvarna handles heavy, wet snow well and will work just fine on the last snow the Northeast got. The Ariens Deluxe will handle any heavy wet snow and also through all the other types including very dry snow well. Good evening, I replaced my 10 year old Airens 28 inch snowblower for the new 28 inch model. I find that the new model makes a hammering noise under load. Do you have any ideas. Hi Michael, With the engine key removed I would tip it back on it’s handles and then wiggle all the augers and fan to see if you can find the rattle/loose part. If you don’t find anything I suggest getting it back to the dealer and let them take a look at it. I’ve written you about this 921044 before. This season I purchased a set of aftermarket skids from snowblowerskids.com. They’re much longer than the OEM or composite Ariens ones and get my machine up higher so I don’t kick up as much gravel from my driveway. But I’m finding the AutoTurn to be a bear–really have to muscle it around. Skids are set symmetrically. Any ideas? BTW–from a previous conversation, I took your advice and ditched the cab, getting a cheap motorcycle helmet instead. Solid improvement! Hi Sal, Ariens moved the axle forward on the latest version of the Deluxe/Platinum series and that fixed any issues with the steering. In fact, I have a Deluxe 30 EFI here this winter and I never adjusted the skid shoes. One’s higher than the other and the auto turn works perfectly. I’d guess that you only need about 10 lbs of lift to pick up the front end with your hand. The other brand that’s using the auto turn also has the snow blower balanced well on the axles. I know the cab was too heavy but you may want to strive for a little less weight on the front. You could play with that balance using a gallon ziplock bag of sand hung on the handlebars. Also check your tire pressure and make sure they are the same. When you push down on the handleblars you also want both skid shoes to come off a smooth level surface at the same time. Here is a video to show you the adjustment. OK, thanks Paul. Will check that out. I bought mine in ’15 so probably don’t have the modified axle. I have a 921032 that I got in October of 2015. First year it ran great, without a hitch. Second year the second-stage impeller broke free of its weld. 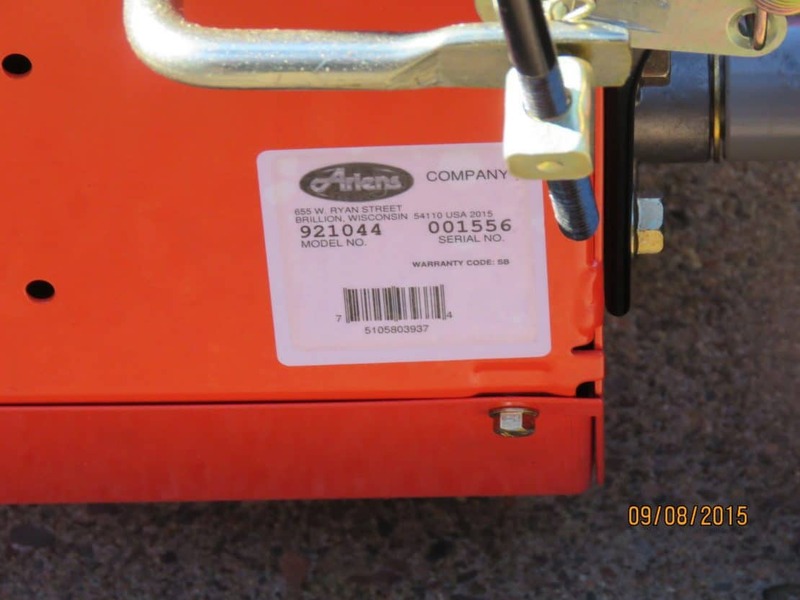 Ariens offered no love on the replacement costs. Toward the end of the year, having come back from the “local” authorized shop (Home Depot doesn’t do service, of course), the recoil starter failed. I spent the rest of the season using the electric start, but that just failed. (yeah, it shouldn’t be the primary start.) Took of the recoil start mechanism and found that inside the sheet metal housing was a plastic pulley, and part of that had broken. *sigh* I am hoping Ariens will help out on this part; the machine is less than three years old. Hi Del, FYI, Make sure you are going through the dealer that does the repairs for the Home Depot where you purchased it. 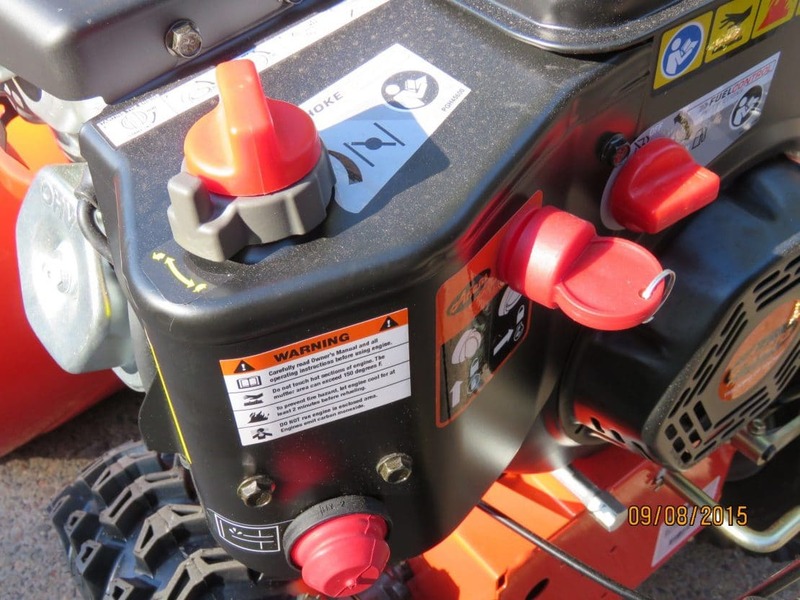 If you haven’t – go back to the Home Depot and ask the manager where who their authorized Ariens repair shop is. That should save you any hassle with warranty issues. Coming from a 20+ yr old Ariens 724 that I’ve pushed the the limit via brute force, I’m looking for new machine for Northern NJ. Typically get anything from a few minor 5″ storms to 36″+ blizzards on any given year. I clear a 40×30 driveway with an uphill (10 deg plus) section of paved driveway that’s 100 ft long, plus 200 ft of sidewalk. Can’t decide between the Ariens 28 SHO or Platinum 30 SHO. Is the 2″ width and additional power, especially for the uphill worth the price difference and weight penalty? Hi Boris, The Platinum 30 SHO is rated for about 10% more tons per hour than the 28 SHO. It has over-the-top power and I’ve never been able to slow one of them down – even in 22 inches of wet snow. The SHO 28 will throw snow just as far but not quite as fast. You’ll have to decide if it’s worth the extra money for the 30 SHO. take it to a warranty shop and they find a crack in the engine block, said it appears to be a manufacture defect. Engine (made by LCT) will need to be replaced. I called another local warranty shop and they said they have had another customer with the same issue. I have also seen a customer feedback on another on line seller who had the same thing happen that happened to me. I’m stuck but this is just for your information. Hi Douglas, I wonder who dropped that pallet of engines. I’ll bet that somewhere in the delivery chain from the engine manufacturer to the Ariens assembly plant the entire pallet of engines was dropped. It wasn’t noticed on the assembly line because oil is one of the last things installed before it’s boxed. Once you get the new engine you will never have an issue again. Thank you for your very thorough and unbiased reviews. I have found them very informative. As of right now I am leaning towards the Deluxe 28 SHO, but wanted to get some of your thoughts if possible. I live in Draper, UT and we typically get pretty dry snow, apparently on average 70′ or so. This year we have had several storms that have dumped 12 or so inches of heavier and wetter snow. I currently have a Toro CCR 3650 that I bought when I had a smaller driveway. My current house has a pretty good size driveway 60′ x 60-70′ that is stamped concrete. My problem is that with my small single stage snow blower I end up throwing and then rethrowing snow and it just becomes too much. I’m interested in the Deluxe 28 SHO because it seems like something that would be very reliable, but will also throw the snow much farther so I can get more of the now off of the driveway without having to re-throw a bunch fo snow. I also like the extra width of the 28″ model because of the ability to make fewer passes. My question really is do you think this is overkill for my area and the snowfall that we typically get? Also, we do get several storms where we only get a few inches…even these smaller storms have proven to be challenging for the single stage snowblower because of the short throwing distance. How does the Deluxe 28 SHO handle smaller amounts of snow? Hi Jason, It will throw the 2-6 inch snows farther than the single stage but that is not it’s strong point. It really excels on those deeper snows. 8-20 inch snows really show how great a snow blower it is. Personally, I think it’s about right for the amount of snow you get. Do you need it? The first time you use it on snow deeper than the single stage could handle you’ll be glad you did. Be sure to get the optional poly shoes for your stamped driveway. Wow Paul, thanks for your quick reply! Really appreciate your help! I will definitely get the poly shoes. Thanks again! Sorry to bug you again, but I was reading a little more of your and others’ comments about the auto-turn and now have a follow up question. It looks like they have made some improvements to the 2016 model and it isn’t as sensitive as it once was. But with my stamped concrete there are some places of unevenness. With the new model and the poly skid shoes do you think I’ll be ok or am I still gonna be fighting it? I’ve read terms like “a true upper body workout” and it has me a little concerned. Jason, Any, and I repeat any review written before Oct 2016 is no longer valid. 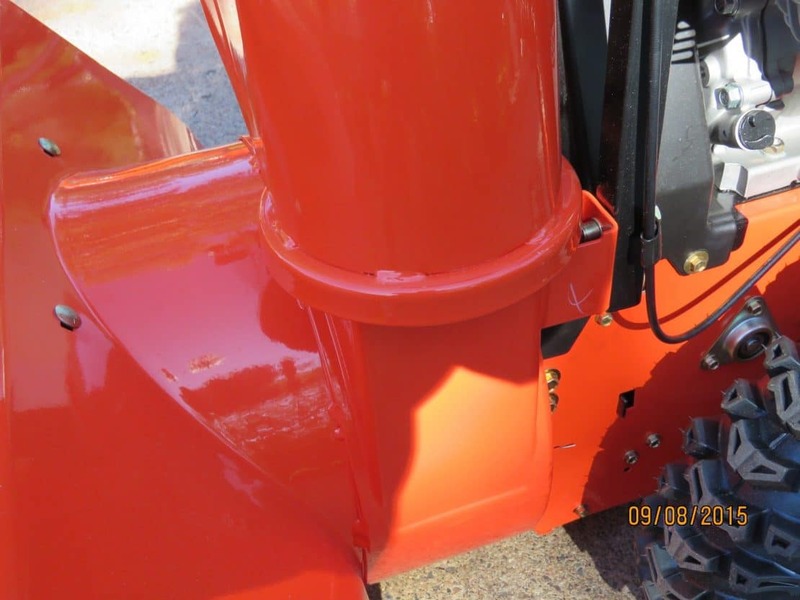 Ariens changed the entire chassis on the 2016-2017 model so it works correctly in all conditions. We never really had an issue with 24 and 28 inch versions in the first place. It was only the 30 inch that really had the issue. Nope, It will do just fine with your stamped concrete. I live in Lewis County NY. We are famous for getting lake effect snow. So far this year the most I got in one storm was 16″ overnight. But I am in the Black River Valley and while Tug Hill can easily get 2 or 3 feet in one shot, usually I don’t get that much. 6-9″ is more typical and also lake effect can dump 2 feet in one spot and 2 inches a few miles away. So sometimes I get a lot but many times it’s just a ‘nuisance’ couple of inches. My real problem is that I have a 50′ wide village lot. My driveway runs right next to the house. I can’t blow much snow off to the other side because there’s less than 10 feet from my driveway to the next house. So I have to blow forward and back. The snow that goes to the front then has to be moved to the other side of the lot and then back between the houses because I clear off in front of the house as welll. I do that because I can’t park in the driveway or I’ll get trapped when the snow slides off the roof. All the snow from the roof slides off right in to the driveway so I essentially have to clear it twice. Bottom line is that I end up blowing the same snow 2 or 3 times to get it out of the way and then I have to do 30% of it again when the snow comes off the roof. I have a John Deere 1032D (which I think is actually an Ariens). The 10 HP Tecumseh Snow King usually starts on the first pull and runs great. I only use the electric start when it’s really cold out. It has plenty of power. The blower is in great shape and handles deep snow just fine. It even generally handles wet snow fairly well without clogging. However, it doesn’t blow snow far enough. I need to blow snow 50+ feet instead of 15~20 feet 3 times. Bottom line is I’m looking for the farthest throwing distance. Clearing speed & width, volume of snow, and everything else except reliability and durability is secondary.Every one who has a Honda tells me it is the best blower they have ever had, nothing throws snow farther no matter what the conditions. But Hondas are extremely expensive and I notice they don’t seem to show up as top rated in that many reviews. Looking for your suggestions. Hi Pete, Any recommendations you get from people about Honda’s are from older machines. There is actually not enough information on the new Honda snow blowers to recommend them. Honda moved the factory from Japan to the U.S. last year and made quite a few changes when they did. Then – they ended up recalling every single snow blower because a problem with the transmission. That’s all fixed but there just are not enough of them sold yet for ANYONE to say it’s a good machine. There are a few snow blowers that will do what you are asking. Toro has a couple, the new Troy-Bilt Arctic Storm and Craftsman 30-34 inch Pro. But there is really only two that I can recommend that will consistently throw and re-throw your snow. They are the Ariens SHO and Ariens Pro machines. These machines will consistently throw 50-60 feet under the right conditions and won’t plug. All of these are dealer machines. You can’t get them at the box stores. If you want to stick with a larger machine the Ariens Platinum 30 SHO will throw the farthest of the residential grade machines. 414cc – About $1799. I do not have a lot of area to clear so width is not that important. I’d take the bigger engine of the Platinum 24 SHO over the extra 4″ of the Deluxe 28 SHO, more for wet snow than depth. Probably worth a couple hundred dollars more. A Pro machine would be nice but no way can I justify the cost. Actually my JD1032 generally has no problem with a foot and a half of snow because when you get that much it is rarely that heavy.The 1032 is generally not even bad with the snowbank left by the plow. It just doesn’t throw snow far enough even if it not that heavy. The machine would be absolutely fine if I could just go down the driveway and parking area and blow off to the side. A shame because the machine is in great shape. There’s just no easy way to make it throw far enough. I’ve cranked up the motor RPM a little which helps, but I don’t want to blow it up. I don’t know if it has enough power to put a bigger impeller drive pulley on the motor. I’d have to find the right pulleys. The motor has a dual pulley now. Hi Pete, Yes, we get “used to” a certain machine and unless we spend some time behind a different model we don’t really understand how much of an improvement heavy duty snow blower like the new Ariens are. I have a feeling that you will be amazed at the overall difference between the Ariens Platinum and the JD1032. p.s. There is a good market for well-kept used JD1032’s. I’ve got about 4000 square feet of cement driveway to clear. I live in Midway, UT where we get about 100 inches of snow per year on average. Hi Christopher, I have three snow blowers that I’m really impressed with this year and I think they will be a good choice for your. They are tougher, and stronger than the previous models. These three snow blowers all have the capacity of the Ariens Platinum but have trigger steering. They have the large 14 inch impeller, nice tires, heated handgrips – all the creature features. They are heavy-duty and will push through snow well for cutting paths and clearing gravel. Craftsman Pro Series 30″ 357cc Dual-Stage Snowblower w/ Power Steering about $1599. Yes Sears/Craftsman is staying in business. Troy-Bilt Arctic Storm™ 30 Snow Thrower about $1499. This does not have the front light the Craftsman has. I think Lowes can get this otherwise you can order directly from Troy-Bilt. Use the search box in the upper right corner of this page and search Troy-Bilt Arctic Storm. I have some videos of the 34 inch version of this snow blower. Cub Cadet 3X™ 30″ HD about $1599. This snow blower is only available through your local dealer. NOTE: When looking around there is an older 33 and 45 inch versions still available. DON”T BUY those. This new snow blower is a vast improvement. Of course the Ariens Platinum 30 SHO and the Toro PowerMax HD 1028 EXLT are also great choices. I just bought a Ariens Platnium SHO 24. I read extensive reviews then decided. We have not had any snow and I might have to wait until next season. One item I read and agreed on was the brilliance of the halogen light getting in your eyes. I took a 6 inch piece of Gorilla Tape and attached it above the light and then folded it onto itself essentially making a small visor and that fixed it. It took all of 3 minutes. The 369 LCT Engine is a monster. 17 Foot Pounds. It’s a beautiful machine. With Testing the Auto Turn in the front yard I’m impressed – very prompt- pivots on a dime. I could never say I wish for snow but I want some now just to use this. Hi Robert, I hope you get just enough snow to play with it once! I think that is arguably the strongest snow blower on the market! I live in Rockland County, New York. I have a 14 Car Driveway. Never owner a snowBlower. It was hard to dig out of the 24″ of snow we got a few weeks ago. The mountain of slush in front of the driveway left by the City Plow was Horrible. I need a Good Snowblower that can Handle it all. I’ve narrowed it down to the following are Ariens Platinum 30, Ariens Deluxe 28, Cub Cadet 3X 30″ or Toro 1028. Which one would help me get through the Slush and Powder of snow? and leave the cleanest driveway with less effort? Do you recommend any other Models? THANKS!!! Hi Rob, Yes, you got more snow out of that one storm than you usually get all year. My second choice is the dealer only Ariens Deluxe 28 SHO. It has a little more power and the SHO impeller so it throws snow a long way. I suggest it over the Platinum 30. The 30 inch tends to be a little nose heavy and harder to steer because of that. My third choice is the Toro 1028 or 928. This snow blower is very easy to use and has all the toys. Like the Ariens it throws snow a long ways and never plugs on heavy, wet snow. Because you don’t get 12-20 inches of snow that often I don’t suggest the Cub Cadet. The 3X likes snow and lots of it but I’m really not that impressed when clearing 2-6 inches. In the $1500 range I know you will be a lot happier with the Toro instead. I want to thank you as I went with your recommendation of buying the Ariens Deluxe 28 SHO and I am very pleased. After the 1st use I wasn’t extremely happy due to the shear weight of the machine and the Autoturn was a bit finicky. I have used it 3 times now and the machine works like a charm. It is actually very easy to maneuver now that I have the autoturn figured out and it throws the snow quite a distance. I will agree that 1st gear is a bit fast and I did replace the steel shoes with the poly ones which made a big difference since my driveway is crushed rock. During my first use the inside of the chute took a beating with the gravel but I am able to control the amount of rocks getting picked up a bit better now. A can of orange tremclad paint in the spring and I should be good. Your site is the best out there so keep up the great work. Hi Brad, I’m glad you are getting used to the snow blower. I have about 15 hours experience using the auto-turn and the more I use it, the better I like it. Thank you for the great articles, reviews and wealth of information you provide. With my current Ariens 932104 in long island NY im constantly having to lever the front of the machine up so the snow doesn’t pass above the intake. Im trying to figure out what models have the tallest intakes to handle the bottom of the driveway plow pile, and the tall drifts, the tallest i can find seem to be about 22″. Have you seen any models with extra tall intakes? Thanks Again! Hi Brian, The Husqvarna 300 series is the tallest with 22 inches. The Ariens and Toro are 21.5 and 21. MTD is also around 21. 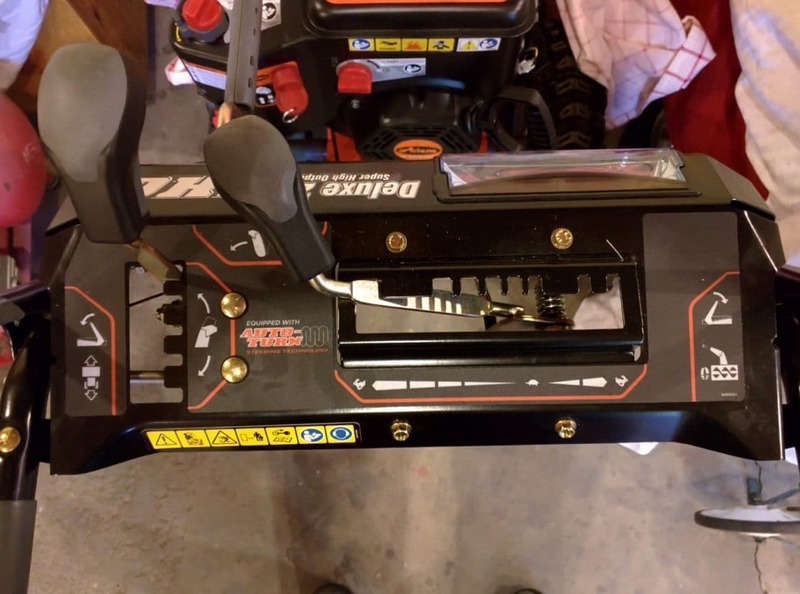 You can get drift cutters for all of them and Toro has the most unique with a drift cutter that cuts all the way across the front. I’ve been in the IT field for the past 30 years. Prior to that I worked as a part time truck mechanic and in the construction field. I’ve come to appreciate the value of quality equipment, especially if I expect that equipment to last for years to come. If you have one “tile job” to do – buy a Chinese angle grinder. If its how you make your living, Dewalt, Porter Cable, or Bosch may be better choices. I used that same logic when buying my first snow blower. For all things mechanical – simplicity is elegance. The Ariens is just that. Take a look at the drive transmission. Few pieces and rock solid. Look at the auger transmission – cast iron. I gravitated to this machine originally on that fact alone! I cleared my first snow with the 28 SHO yesterday. OMG what a beast!! I couldn’t have worked it any harder (24-30 inches) in snow, ice, and plowed snow. Yes – it was my first time using a snow blower and its a bit to get used to but its everything that Paul has mentioned. I got a little beat up in the first hour but now I’m confident that anything below 21 inches will be a walk in the park. I have an odd shaped driveway thats 4 cars wide and anywhere between 70 and 40 feet long with one side that’s curved. it has a steep incline. I cleared 1/2 of this space at 24-30+ inches in an hour. The other half my wife an I hand shoveled over 2 days at around 11 hours. On a 5 star scale I give the Ariens a 6. This is my first snow blower so take it for what its worth. I may not know much about blowers but I do know quality welds, heavy steel parts, and simplistic designs when I see them. Hi Patrick, To a “gear-head” there is nothing more beautiful than watching the Ariens Deluxe 28 SHO snow blower throw snow. The SHO impeller is one of the best kept secrets in the snow industry. Have your wife take a video of you using it so you can watch it this summer and prove to your friends how good it actually is! I’m really hoping you can help me find the right snow blower. You write an excellent review, and I think your opinion will help sway me to buy the right machine. I live in rural howard county, md and have about a 100 foot driveway with a large apron in front of my 3 car garage. My drive way is quite steep in some places, approximately 6 to 8 degrees, and curves as it winds up the hill. As this is a new house (an asphalt driveway), I have not purchased a snow blower yet, and paid the price with our recent 30 inch snow fall. I’m seriously considering the Ariens Deluxe 28 SHO Model 921044, but am concerned about its ability to make it up my drive way, and my control of it heading down the drive way as well. The poly skid shoes are enticing, as are the chains for the tires, but those seem to jack up the price tag another $100+. Any thoughts on the right machine? Thank you for your input! Hi Matt, Sorry for the delay. It’s been a crazy week. Chains and poly shoes add to the cost but they are cheaper than a tracked version. The Platinum 28 SHO Track is $2300. A comparable 27 or 30 inch Husqvarna track is $25-2700. I don’t have any hills to test snow blowers on but the 28 SHO I have here has no tracction problems on any kind of sruface I have tried it on. It does well on gravel, cement, and lawns. I suggest talking to your local Ariens dealer and see if he would be willing to let you try a Deluxe 28 or Deluxe 28 SHO out on your hill. The 30 inch Craftsman model 88396 is balanced well meaning it has good traction. It comes with poly shoes. For the amount of snow you get it will do a good job for you. The Toro Snow Removal Power Max HD 928 28 in. Ohxe Two-Stage Gas Snow Blower 38801 is another good choice. Thank you for your assistance with the chute (from December 29th), Paul. I actually found the issue myself and it was so ridiculously obvious I feel stupid now! 🙂 There is a bolt with a spring that sits underneath the teeth plate that turns the chute. My bolt was too loose, so there was no tension on the chute to hold it in place. As soon as I tightened that bolt a little, the chute holds in place much better now. Thanks again! @Mark, Mr Obvious is always better than a $100 bill from the dealer to do the same thing! Hi Bill, Driving the Ariens Deluxe/Platinum is completely different experience than any other snow blower you and I have ever used. Instead of having a locked axle that forces it to go in a straight line it’s like driving a walk-behind mower with caster wheels in the front. You control it – not the other way around. In addition the first gear on the Deluxe SHO is faster than the first gear on the old snow blowers. It took me a little while to get used to it because I had to react to it faster. I had a chance to use the Deluxe 28 SHO and four other machines that use trigger steering this week. I used them one right after the other and compared the steering, ease of use and how far they threw snow. I used each one about 15 minutes. After those tests I still had about 45 minutes of snow to clear – guess which one I picked to finish up? The Deluxe 28 SHO. It threw the snow the farthest. It had the most power per inch. I had to reach over the dash to use the chute control but it was still easier to use than the other four. Finally, it was a lot easier to steer. I had the gap under the scraper bar exactly the same on all five machines. The Ariens handled cracks in the cement, pavers and turf better than the rest. The others would catch on something sticking up, loose traction and stop. Even with the trigger steering they would jerk around more than the Ariens. One other brand jerked me around so much that I am not going to recommend it anymore. Now, This is my third year with an Ariens Auto-Turn and I’ve got about 15 hours experience. I have become experienced enough with it so it is easy to keep in a straight line. So, please spend a little time using it and I have a feeling you will like it. Hi Paul…I hope you had a terrific holiday season and that you are ready for winter. I purchased the Ariens Deluxe 28 SHO this past Fall after discussing it with you, and today was my first use of it. I can tell already that I am going to like it…it throws the snow a country mile and I LOVE the zero turn! I’m still getting used to the auger and clutch being opposite from my old blower, but I’m sure that won’t take long. One thing that doesn’t seem right with it is rotating the chute. It rotates just fine when I crank it. But if I have it cranked over to the left or right, as soon as I engage the auger the snow pushes the chute straight ahead. I ended up having to use a bungee chord to hold the handle in place, but that is a pain any time you want to rotate the chute. Is this an installation issue? 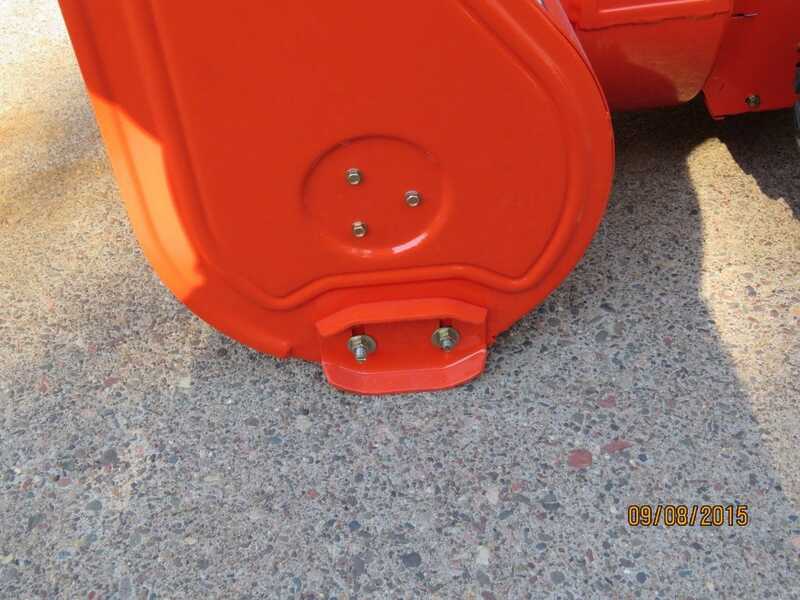 Is this a common problem with Ariens snowblowers? Any ideas as to what could be wrong? Thanks again, Paul…I appreciate your input! @Mark, everytime I use the Ariens SHO models I am just amazed at how far they throw. No, that crank should stay put. I’ve had a few different Deluxe models here and they all stay pointed where you aim them. I suggest calling your dealer and asking them what’s wrong. They may be able to tell you right over the phone what to adjust. I purchased the Ariens 921044 a few weeks ago (replacement for a similarly-sized 25 yr old Bolens). This week we received 8″ of snow. Here are my feelings after using the Ariens for the first time: The lowest forward running speed is still faster than the lowest forward speed on the old Bolens. That’s a disadvantage, IMO. The blower moved too quickly and went over rather than removing some of the harder packed and wet snow. Not sure if it because of the Auto Turn or not, but the machine kept drifting off course. Despite the Auto Turn, I found the Ariens more difficult to manoeuvre. Not sure if any of the competing brands are superior in these respects, but, to date, I’m not particularly impressed. Hi Richard, I’ve had a few other people state that the Deluxe 28 goes faster than they like to walk and the one I used did take a little time to get used to. I was so used to crawling along with my old Craftsman track drive that it took me a while to get used to a heavy-duty, high performance snow blower. What I did notice though that it never ran out of power. I had 2 snows that year over 15 inches and it handled them both in 1st and 2nd gear well. It’s not the Auto-Turn that causes the snow blower to drift off course. I’m going to give you two reasons why it drifts and what you can do about it. 1. 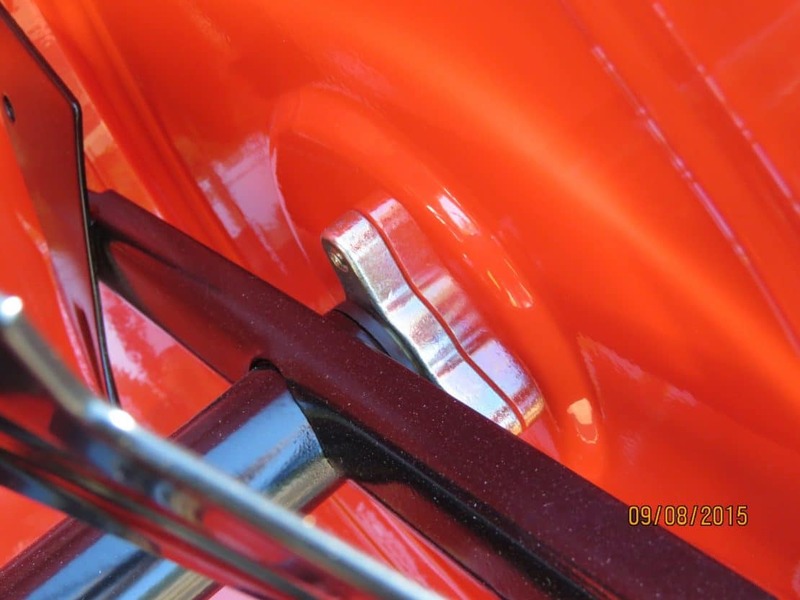 Have you ever used a push mower with front caster wheels? The Ariens Auto-Turn is similar. Let me tell you a story: One year my mowing crews talked me into buying push mowers with front casters. They stated that they could save time trimming and mowing the residential lawns. I put the caster wheeled mowers with each crew and after a couple of days I asked them how they liked the mowers. All of the crews just loved them. But after the first mowing my residential customers started calling in and complaining about the horrible job my crews were doing. One large condo even stated, “It looks like you used a herd of Drunk Goats!” So after two weeks I welded all of the caster solid. Why? With a conventional walk behind mower the front and rear wheels keep the mower going in a straight line so really all you have to do is walk behind the mower and it does a perfect job of pattern mowing. But with a caster wheel mower you have to steer the mower to go in a straight line. Because of the undulations in the lawns my crews were unable to mow in a perfectly straight line resulting in a “horrible job.” So how does that apply to the Auto-Turn. With a conventional solid axle snow blower or one with trigger power steering the locked axle keeps the snow blower going in a straight line. But with the Auto-turn you have to use the handle bars to steer it to keep it in a straight line. It’s faster and easier to turn than a solid axle, but a little more work to go in a straight line. Most of us switch to poly skid shoes and that helps. If you made any of these three changes the snow blower will now track better for you. Thank you for the excellent review. 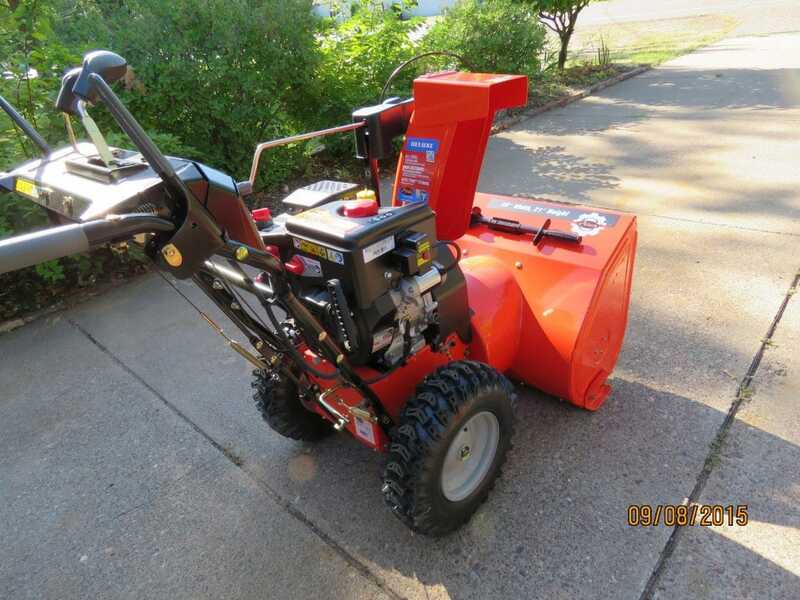 I have had my 1990-ish Ariens 24 for 18 years and while it works OK, it seemed a little tired and I wanted to upgrade to a more powerful unit as the last few winters have been a little rough. 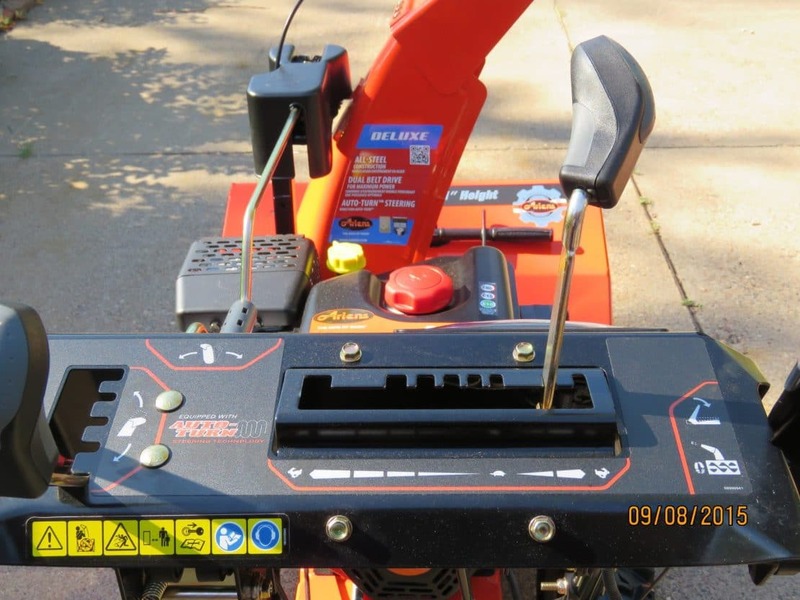 I was on the fence between the Ariens Deluxe 28 and the Husqvarna ST227P. The Husky was less expensive and for the most part appeared to be about the same capability as the Ariens, but I wasn’t a fan of all the cables, the plastic dash, and the wires all hanging underneath. The Ariens just seems like it is built to last forever. I take great care of my stuff and I am sure both would be fine long term, but I was leaning toward the Ariens. 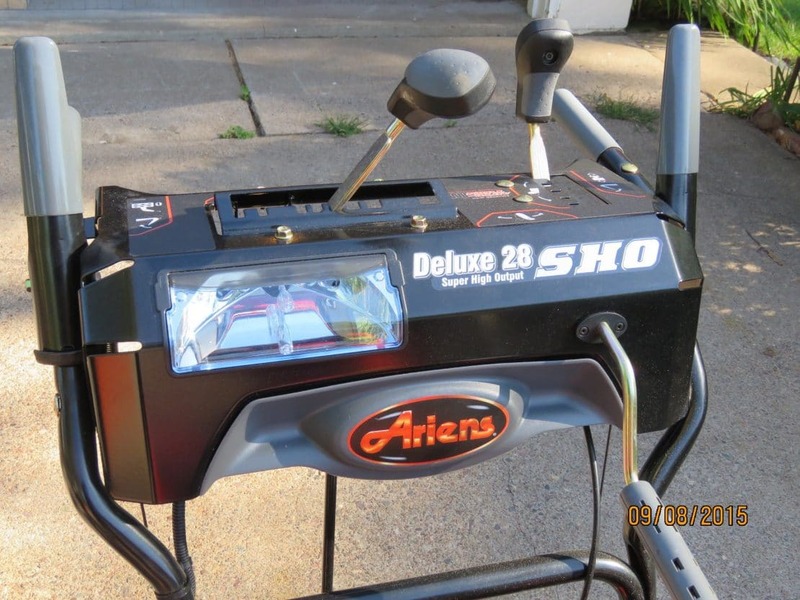 After shopping around I found that the Ariens Deluxe 28 SHO was only $100 more ($1,277 OTD). That was enough for me. I bought it over the phone yesterday and expect to pick it up by the end of the week. Thanks again. 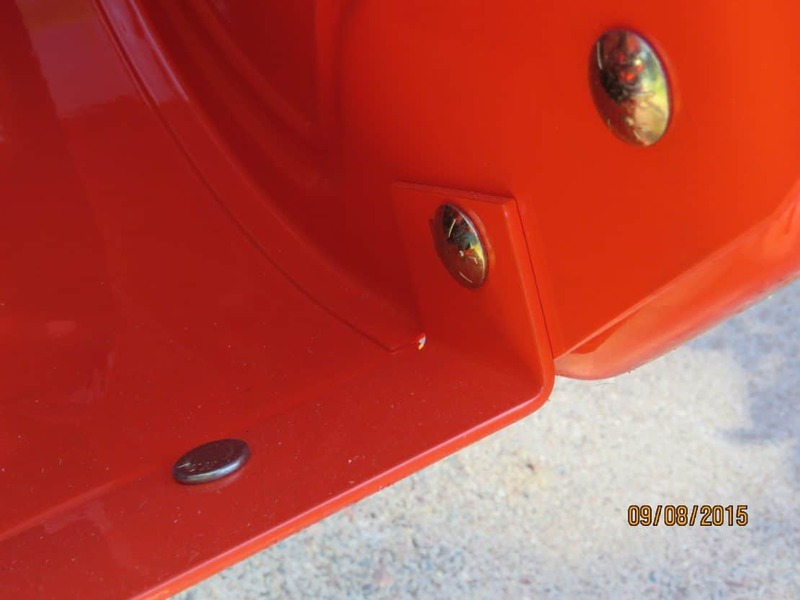 Regarding cabs–I recently installed the Ariens 72102600 cab that’s supposedly designed for any Ariens 2-stage snowblower. What a nightmare! Took a ridiculous amount of time and the results are very unsatisfying. That chute control handle out front is a real problem. And the clamps for the cab just don’t fit well with the contour of the 921044 handlebars. I had no choice but to utilize the extension poles the cab comes with and now the cab is ridiculously high and there’s a wide open space below for weather to get in. the chute rod is the real culprit. I don’t know why they didn’t leave that on the “dash” as a left/right handle. They made the transmission left/right which makes no sense to me and is counter-intuitive. Handles for transmission should be forward or backward. The snowblower may work out great (still waiting for first snow) but the cab is a disaster! Hi Sal, I agree, Cabs are a pain. I’d rather grab my motorcycle helmet than fight with a cab. In addition they don’t last more than a year or two. You have to keep them out of the sun of the clear plastic gets hard and cracks. The Ariens Deluxe, Platinum and Pro series are all about longevity. The chute control on the deluxe is a little awkward to use but it NEVER fails. I really don’t have a comment on the gear shift. I guess I’m used to each brand making their machines their own way. There is no standardization on the dash – just like cars. For example, I just bought a Subaru. I still haven’t figured out all the stalk levers knobs and dials. It’s the most complicated dash I have ever owned. Thanks for yet another fantastic review! While I was looking at your picture of the impeller, and your comment about how far it will throw, I noticed the spacing between the impeller and the housing. I wanted to increase the throwing distance on my snow blower and I read about some “impeller kits” that state they increase range. However, I would be surprised that if this indeed works, why the manufacturers haven’t included it in their designs. Do you have experience with these impeller kits? Do they work or do they have disadvantages that might not be obvious at first? Why do the manufacturers leave this spacing? Hi Peter, Those kits were popular 15 years ago when no one was making high output impellers. If you have an old NOMA or Simplicity that you just can’t get rid of the impeller kit will help but the Ariens, MTD 3-stage, Toro and Husqvarna blowers are all using a newer style of impeller. The Ariens SHO is engineered to throw snow as well as possible without the impeller housing icing up or plugging up. How clumsy would a cab be on the Ariens with the direction control out front? Looks like my choices just narrowed to the Toro or the Husky. Thank-you for that. Hi Paul, i posted the other day – not sure if you got that post as i wasn’t registered on MovingSnow only on TodaysMower. By the way, you helped tremendously with me getting into a Sears Pro 2014 42″ yard tractor which has been great for us, so i really appreciate that help again. In any case, i have been reading more on your site and am better prepared to ask better questions i believe at this point. Situation – we live in St. John Indiana (northwest Indiana) just southeast of Chicago – about 15-20 south of Chicago along the 80/94 corridor near Lake Michigan. I don’t know how much average we get in snow each year – from what i looked up it seems average of 25 inches – not sure if that is right. Was trying to find that out to help get me to the right category. Our driveway is about 15 feet wide and 120 feet long, and flat and concrete (no hills or slopes). Based on this info and reading your guidance, it seems i should be looking at a residential version (versus the heavy duty) and something in the 26-28″ size based on size of my driveway and the amount of snow on average we get. that helps as i didn’t want to spend the 1799 on the top recommended Toro. The power steering seems attractive so it seems there are three good options – or at least 3 i’ve honed in on – Craftsman 88394 $999 (28″), Toro 826 OXE 37781 (26″) $999 or Ariens 921030 Deluxe 28 $1099 (so not the SHO model). Any recommendations among these three based on my location and needs or I am missing other models? Pros/cons? If you can provide some input to help steer me in n the right direction, that’d be great! There is a local dealer that carries both Toro and Ariens and another local that has just Toro and also we have Sears stores nearby, so local service among these stores will be good and available. Thanks for all the info on the site – it seems there are so many more options in the snowblower area than the lawn/yard/garden tractor area – not sure how you do it! Hi Paul, I answered you earlier today and this is what I wrote. Hi Paul, For about $1000 you can get a good snow blower for St. John. You don’t need the Toro Power Max HD – the PowerMax series will work well. Likewise an Ariens Deluxe 28 is a good choice. You don’t need the SHO or a Platinum. Here are two links you can use for reference. The 88394 is also a good choice. The Toro has the best chute control and is very easy to use with the new automatic steering. The Craftsman is easy to use and uses triggers for the power steering. The Ariens also has the automatic steering but to crank the chute you have to reach over the front of the dash and some people say that’s hard for them to use. The Craftsman will be the least expensive if you join the Shop Your Way Program at Sears. I really don’t have a personal choice for these three. I suggest going to the dealers and see which one you like the best. Hi Paul, I wrote an answer for your original question this morning. I post it again here. Yes, there are over 400 different snow blowers to pick from. For about $1000 you can get a good snow blower for St. John. You don’t need the Toro Power Max HD – the PowerMax series will work well. Likewise an Ariens Deluxe 28 is a good choice. You don’t need the SHO or a Platinum. Hi Paul thank you so much! I was interrupted in my quest here this past weekend as we had a nasty first snow 🙂 – this just got me more excited about the search (using my old Toro single stage 2450) I think i have decided on either the Ariens 28 Deluxe or Toro 826 OXE – leaning toward the Toro. I stopped by Home Depot and they had the Ariens 28 Deluxe but not the Toro 826 but a similar powermax model – 724 i believe. The 826 is only a few pounds heavier than the 724 – on the other hand, the Ariens 28 Deluxe is a much heavier unit than the 826 and is a tank (224lbs vs 176lbs)! (a compliment to the Ariens for the solid construction) i wasn’t too keen on the crank/handle for turning the chute from left to right and it seemed very front heavy. I really did like the joystick tool that controls the chute on the Toro also. A few final questions – 1) i noticed in reading somewhere that the Toro 826 OXE has something called “Automatic Steering” versus “Power Steering” on the 826 HD and more expensive models up from this. The power steering description states “turn on a dime. Wheels can be disengaged independently or simultaneously with trigger controls”, whereas the automatic steering states “allows smooth, tight turning without pulling or strain – no triggers or levers required”. Is the automatic steering something to be concerned about? Not sure of exactly what the diff is between the two – can you clarify. To get power steering i’d have to jump to the HD model for $300 more and that one is as heavy as the Ariens. 2) my wife and older kids would probably like to help once in a while – is the weight a factor i should considering as far as easy of use and manuverability (176 lbs for the 826 oxe versus 224 lbs?) 3) at $100 difference, i feel the Ariens is a better built unit, has 2″ more of coverage and auto-turn (not sure if theirs is better or if it is power steering or automatic steering, etc, bigger tires, blows to 50 fee – i just don’t want to pick the wrong one) and 4) should i instead be looking at the Snowmaster 824 for our 15 foot x 120 foot driveway in NW Indiana? this is that hybrid you discuss on your website that is 2 stage technology in-line. The price is comparable to the 826oxe so i don’t want to overlook it (900 vs 1000) but not sure if it would do as good a job as either the Ariens Deluxe 28 or Toro 826oxe. 1. The 826 OXE has about the same balance as the 724 2-stage so it is very easy to use. Yes, It’s lighter than the Deluxe 28. Toro uses high tensile strength steel that is just as strong as the thicker, heavier steel of the Ariens. 2. The Ariens is nose-heavy compared to the 826. The advantage of that is it will push through hard drifts or packed down snow better – the front won’t ride up as quickly. The disadvantage is that makes it harder to lift the front to maneuver. 3. Both the Ariens Deluxe 28 and the Toro 826 OXE use the General Transmissions DI300 Intuitive Differential. Because the front of the Toro is lighter than the Ariens it works really well on the 826. 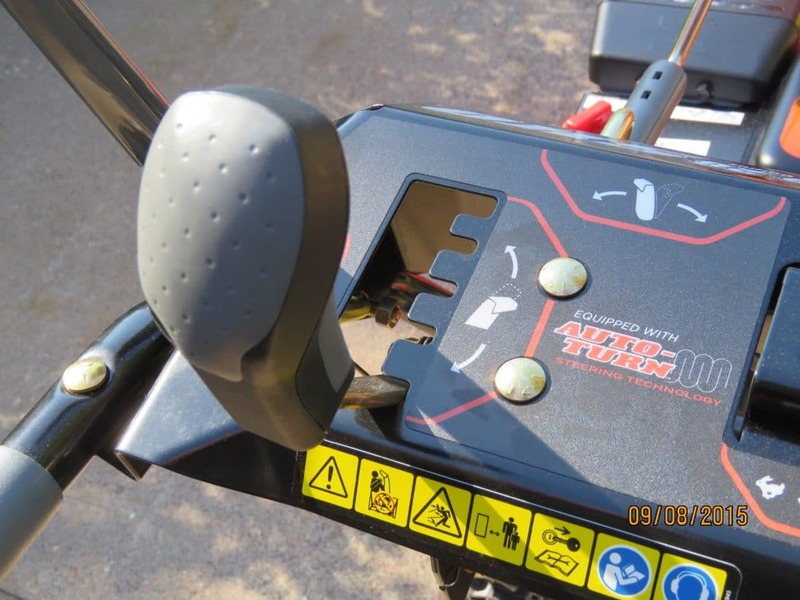 Ariens calls it Auto-Turn – Toro calls it automatic steering. It’s so simple to use and will never give you any problems (it uses one part – trigger steering uses 30-50 parts) The best feature though is there is nothing to learn, no triggers to pull, it just gives you full traction to both wheels all the time yet turns as easily as a differential when you turn the snow blower. 4. I’m not partial to either brand. I feel the build quality is the same for both brands. They just do things differently. Both machines will give you years and years of use. 5. I’m not confident the SnowMaster is the best choice for your area. Yes, the SnowMaster is a lot better than your old CCR but like you found out this weekend it will have limitations on how much wet stuff it will throw and how far. The 826 OXE will consistently throw the snow 2 or 3 times farther than your CCR. It will handle deep drifts, snow plow drifts and move a lot more snow than your CCR or the SnowMaster. 6. All things being equal 2 extra inches is only going to save you about 6 minutes on a 120 foot driveway. Paul, you really made my day. Thanks for the timely reply and for helping me through the weeds on these questions. I feel much better about the decision making process now. Your comments helped me eliminate the SnowMaster – and took the doubt out of my mind there, and also, what a blessing really knowing that the Ariens Deluxe 28 and Toro 826 oxe are really both great values – just offer a few different features depending on the need, and that you really can’t go wrong with the value and longevity of each. I’m going to go for the Toro 826 oxe based on your input, the manuvuerability or weight, and joystick. I’ll let you know how it works out. 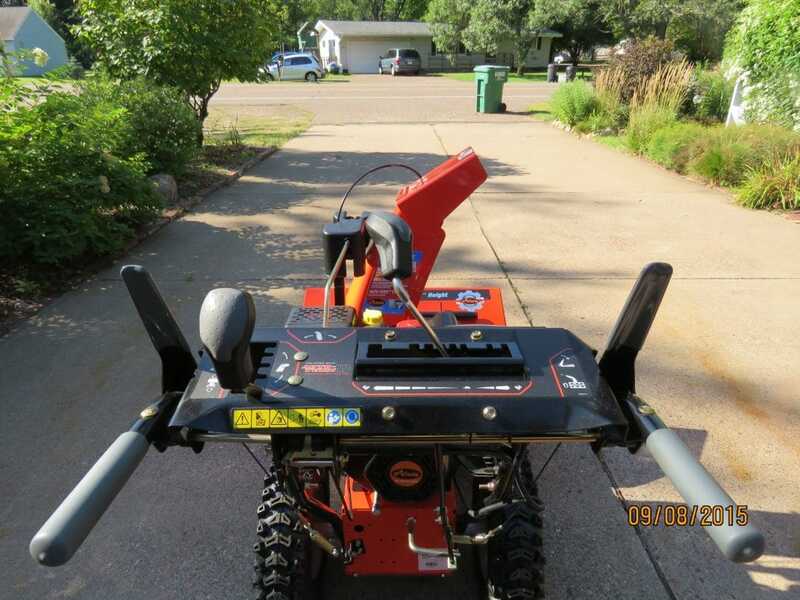 I asked you about this before when we talked about mowers – since i’ll be buying this from a local dealer that is a relative of the family, can i send you a gift card or something? I am just very grateful and appreciate all of what you do with these websites. I have told several guys at church and other friends about the websites so hopefully there are more followers. @Paul, Great! Feel free to stop back later this winter and tell us how it’s working for you. I appreciate the vote of confidence, but I don’t need anything for helping you. Tell your friends and ask them to tell their friends. Movingsnow and TodaysMower.com have grown exponentially just by word of mouth and it all works out that way money-wise. If you feel you must donate I recommend this site: Habitat For Humanity – Grundy-Three Rivers : (disclosure – my daughter is the Executive Director) Grundy-Three Rivers is doing wonderful work and even a dollar helps! Fantastic reviews and site. I live on Long Island in Smithtown and have a driveway that fits 8 cars. For the past 10 years I have used the 7.5 hp craftsman and she has worked great. Last couple of years I have been blowing 6-7 houses each storm since none of my friends have a blower. I was thinking of upgrading and buying the Craftsman 88870 which would hopefully get me 20 years but after reading some about the Ariens Deluxe 28 SHO and the Husqvarna st 324 I’m undecided. I’m 6’0 so not as concerned about handle adjustments and not sure if I really need the power steering either. Do think the hand warmers are nice feature if they really work. Can you please help point me in right direction so this machine can be my last machine I purchase. Hi Chris, The power steering will help with the backaches after clearing 6-7 houses. Now, You only average about 30 inches a year so a Craftsman 88394 at Sears.com, an Ariens Deluxe 28 at Home Depot, or a Toro 826 OXE at Home Depot will give you long life for less money than the Craftsman 88870, Ariens SHO or ST324P. The 26-28 inch size will help you clear your drive and all the others faster. Craftsman doesn’t use handwarmers. They are optional for the Ariens Deluxe 28 and they work. The handwarmers on the Husqvarna ST324P/327P also work. I just purchased the Delux 28 SHO and I can’t wait for our first snow! Thanks for the great review and all the pics – they were extremely helpful in helping me locate different things on the blower. Question: Do you recommend using the Mobil 1 grease over the Sten Mix grease 00036800 recommended in the owners manual? Also, in your pics of the auger gear box, is the front of the gear box see through? Is that the oil level I am seeing (I am not home right now to look at my own blower)? Hi Mike, Use what’s recommended in the manual or any good lithium greased (not wax based). No, there is no level indicator on the front box. You should never have to check the oil level in the front gearbox unless you see a seal leaking. Excellent review! I really like the new photo format. I think it works really well. Tell me, is the SHO version new for 2015? Great reviews, thanks! I have a paved driveway about 300ft long with a hill, at the end of a cul-de-sac without street lights. I live in CT, so get the nice Northeast storms. My dealer has the Ariens Deluxe 28 SHO and Husqvarna comparable models within my budget. I know the Ariens brand has the better proven history, but the Husqvarna same price range has much more bells and whistles……heated handles, adjustable handle heights, two lights, easy control panel, and my biggest question is an easier Chute Control. 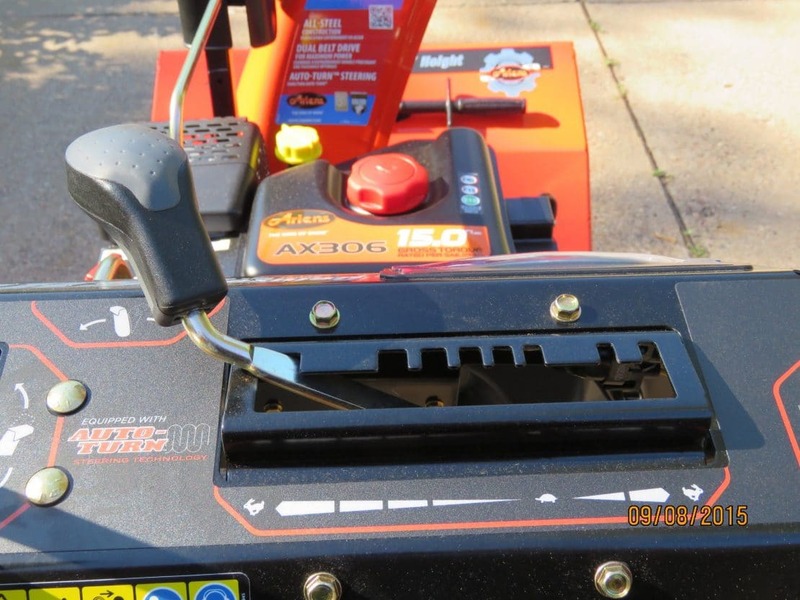 Is the Ariens crank type reaching over the control panel that much harder than the dashboard type? Is the downside of Husqvarna chute control the cables and durability of cables? Does one work better in my often wet heavy snow, or sometimes icy? How about any other feature I may have not mentioned? Which one should I buy? Hi Thomas, The reason the you get more features with the 200 series Husqvarna is because you get less machine. It’s not near as heavy-duty as the Ariens Deluxe SHO. The 200 series Husqvarna compares to the Ariens Compact snow blower line. The Husqvarna 200 series I suggest for owners who get 40-70 inches a year and want all the extra features. 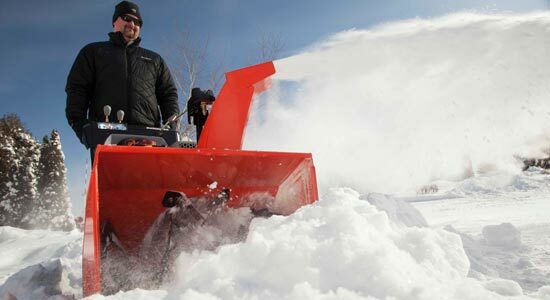 I suggest the Ariens SHO for owners who get 40-120 inches a year, want more durability than extra features and want to throw the snow as far as possible. Now Husqvarna does make the 300 series. This compares to the Ariens Deluxe SHO and Platinum snow blowers for capacity and durability. In addition it has a hydrostatic transmission that adds about $300 to the cost. The Ariens Platinum 30, Husqvarna ST330P and Toro 1028 are very comparable for size, power, and durability. The Ariens Deluxe SHO and the Husqvarna ST327P are comparable but the Husqvarna costs more because it has the heated hand grips, 4-way chute and hydro trans. The hand crank chute on the Ariens is bullet proof but customers under 6 feet tall state that it is hard to reach over the dash and use. If both you and your wife are going to use the snow blower one of you may not like the high handles and reaching over the dash. The cables on the Husqvarna are commercial grade, sealed cables so they don’t go bad. So, if you live in an area of CT where you only get 60-70 inches a year the Husqvarna 200 series is a good choice. If you live in an area the gets more snow and you don’t want to spend over $1200 then the Ariens Deluxe SHO is the best choice. If you want the extra durability like the Ariens but want all the bells and whistles then buy the Husqvarna ST327p or ST330P. Do you think the extra almost $600 for the Toro 1028 is justifiable over the Ariens Deluxe 28 SHO for a flat 125′ driveway in Vermont (150″ per year)? Hi Patrick, Have your played with them at a dealer? They are both tough machines but they “feel” very different. The Toro is balanced better and the chute controls are nice. Some people think the Ariens is too heavy in the front and the chute controls are awkward. Some people like the Auto-Turn on the Ariens and others prefer the trigger steering. The Toro has hand warmers but you can install them on the Ariens. I bought the 30″ Deluxe. I live just outside Winter Park Colorado and at our house we average around 200″+ a year with some big winds/drifts. I have a long gravel driveway so I went with the 30″ to save a pass. I feel like it is going to have more than enough power but was curious about the SHO/Platinum impeller. If I feel like I need more throw can I buy the SHO/Platinum impeller and put it on my machine? Hi Dallas, I don’t know that one. I suggest talking to your dealer. He would know if the parts will interchange. But…The Deluxe 30 throws very far already so keeping the same engine I have a feeling you would only gain a few feet. The first place on went to was a Husqvarna dealership because my riding lawn mower is a Husqvarna. When I talked to the Ariens dealer he said the Ariens was a much better machine, but that is what I would expect him to say. I will due my due diligence and check out the 300 series and also the Toro for prices and quality. I am glad that I can cross the 3 stage off my list…I was definitely going back and forth. The Ariens has a 5 year warranty on the Cast Iron Gear Case and the usual 3 year warranty on every Ariens product. An Ariens dealer told me today that they are offering a special promotion for 5 years that ends this week. That sounds Good! Do you happen to know the warranties for the Husqvarna and Toro recommended heavy duty machines mentioned above? Hi Ray, They are three years and I think Toro still has an extra year promotion also going on. Thank You Paul for your quick reply. I was leaning towards the Ariens. I live in RI and we received alot of snow last year. I also live on a cul de sac (not regulation size) so the end of my 8 car driveway gets extended by about 10 feet of heavy plowed snow. Plus I will be doing a path to my backyard for the dogs. I also plan on helping others in the Cul de sac for the big storms. The Cub Cadet sales associate says the 3 stage does the job faster but I am not sure if it will be as durable as the Ariens. The Sears model is runnng a 20% off promotion so the price is $1299. Do you recommend 2 stage over the 3 stage in the scenario above for the models listed earlier (Ariens Sho, Sears Pro and Cub Cadet 3 stage)? Hi Ray, yes, I suggest the Ariens over the Cub Cadet and the Craftsman. I feel the Ariens Deluxe/Platinum, Husqvarna 300 series and the Toro Power Max HD are the three best heavy duty snow blowers this year. The Cub Cadet 3X HD and the Honda HSS have some quirks that makes me rate them as lower quality/ less dependable. The standard residential Cub Cadet 3X (with the black chute), Craftsman Pro and Troy-Bilt Vortex are not as durable as those 5 machines. The Ariens SHO lists at $1419 but most dealers are selling it for $1199. This review was very well done. I have been to a couple of Ariens dealerships and like the quality of this machine. In addition to the Deluxe 28″ Sho I am considering the 28″ Craftmans 3 stage Pro Series with the 357 cc and Power Steering Model # 88874 and the Cub Cadet 3 stage 26″ (Not HD because of price) I don’t want to pay over $1300 that’s why the smaller 26″ for the Cubby. The Cub Cadet authorized dealer says that they have a patent on the 3 stage design so they make the Sears and the Troy Bilt models. What would you recommend of these 3 choices? It really depends on the size of your drive, what else you want to clear and what you expect for service. If you buy a Craftsman you can move anywhere in the U.S. and the warranty follows you and service is always done in your home. If you buy from a local Cub Cadet dealer you have personalized service and he may even have a spare if your dies. 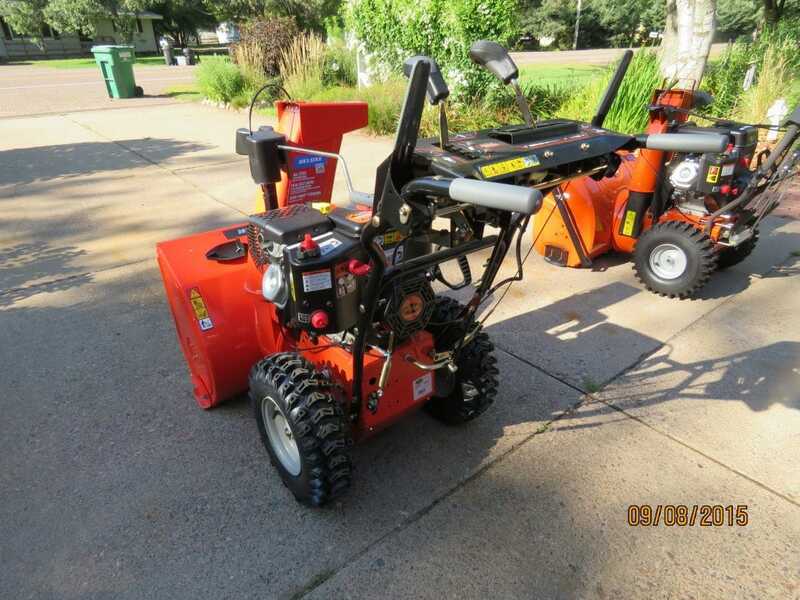 The Ariens has the best resale and has the most capacity. It’s one tough snow blower. 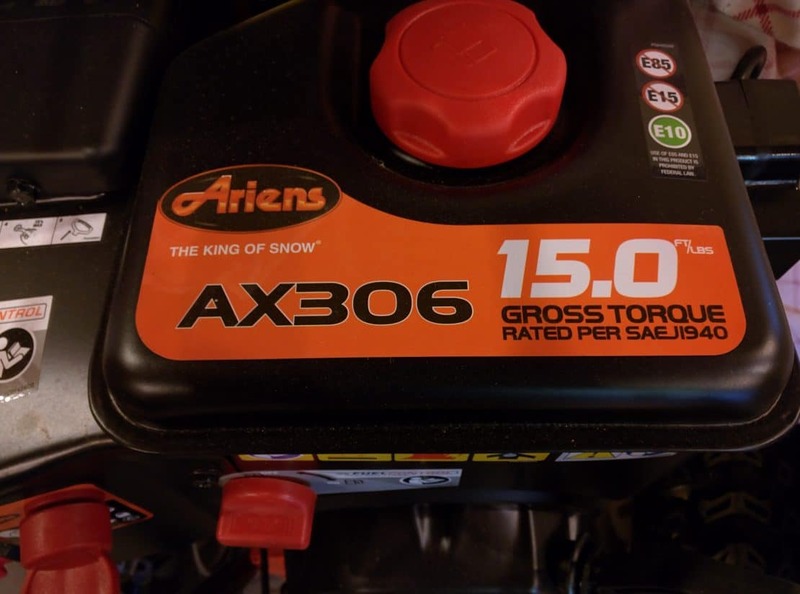 Hi again Paul, The Toro 1028 has a fuel capacity of 3.4 Quarts or 3.2 L. Do you know the fuel capacity of the Ariens Deluxe 28 SHO or the Ariens Platinum 30 SHO? I tried looking that information up on the Ariens spec sheet, but they don’t provide it. I appreciate you taking the time to explain this so well, it really shows that a lot of thought goes into designing/engineering these machines. @Rich, Yes, I’ve been lucky enough to learn from some of the best engineers in the L&G industry over the years (a few are still alive) Snow Blowers are actually complicated systems and like every mechanical system there are trade-offs between capacity, performance and cost. The good companies forge the path and test, test, test. Those are the same companies that listen to the customer and then build what the customer wants. Other companies copy just outside the patents, cut costs first and then wonder why they keep losing market share. It’s nice to see you back, you must have been like a kid in a giant candy store at the GIE show. I hope that you enjoyed it though I know you were also working and doing a lot of walking. I wanted to ask you what is the main difference between and open flight auger and a closed flight auger? If the side of the auger has a bar connecting the 2 ends is that considered closed flight? A closed flight auger is used to move a metered amount of material. A grain auger the farmers use to fill grain bins is a good example of an auger that uses closed flights. It meters the grain so well you can use a watch to determine how much grain you have put in the bin. In a snow blower it moves the snow but limits the amount of snow going into the impeller so the whole system stays clog free. Closed flight snow blowers tend to have smaller discharge chutes and can be used with smaller, more fuel efficient engines without plugging the discharge chute all the time. Craftsman, Cub Cadet and MTD use a closed flight auger. This works well to meter the snow into the impeller and one of the main reasons why the 2-stage MTD built snow throwers did not require a large engine to do the job. This helps to keep to much snow from getting into the snow blower and to help keep the chute from plugging. 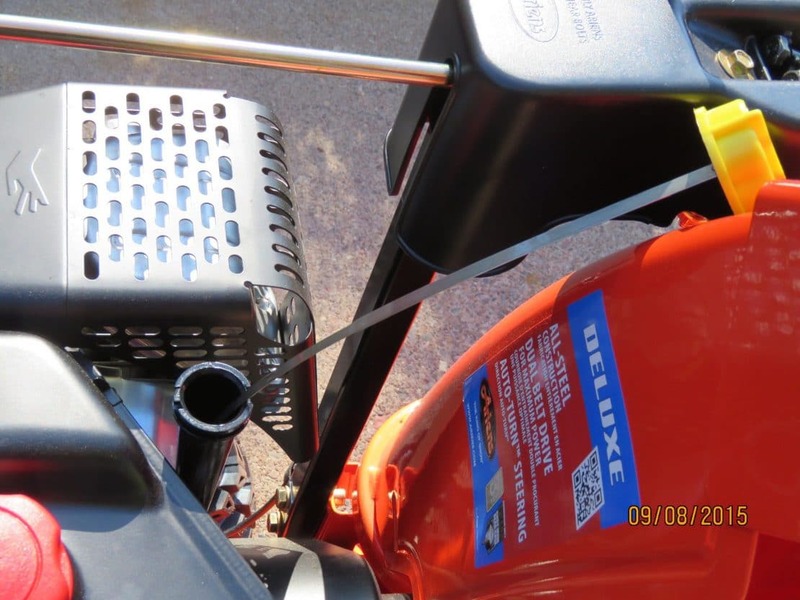 Husqvarna switched from a closed flight to an open flight last year because they found out their closed flight auger was limiting the capacity of their snow blowers, especially the 30 inch with the 414 cc engine. Ariens has always used the open flight auger to give you a high capacity machine. If you notice their discharge chutes have always been larger than anyone elses. Toro is a completely different system. The current 2-stage machines use an open flight auger for high capacity but also have the Anti-Clogging system which meters the snow going into the impeller inside the machine. Their system can throw snow very far and still use a smaller, fuel efficient engine. I have been researching quite a few snowblowers and have come down to the Ariens Deluxe 28 SHO, Craftsman Pro 28″ with 357 cc engine- 3 stage and Cub Cadet 26″- 3 stage. They are all in the same ballpark for price. I live in New Hampshire, so we get our fair share of winter snow. I just wanted to know which machine you would recommend out of the three. I really like the feature of the 3 stage system, but is it really worth it compared to a great 2 stage? I will be purchasing in the next week or so and just wanted some help and advice? Hi Josh, The major manufactures have realized in the last five years that they can get a lot more snow through a 2-stage snow blower by adding large engines and changing the front auger/impeller to move more snow. Husqvarna switched from a closed flight front auger to an open flight and 4 blade impeller. 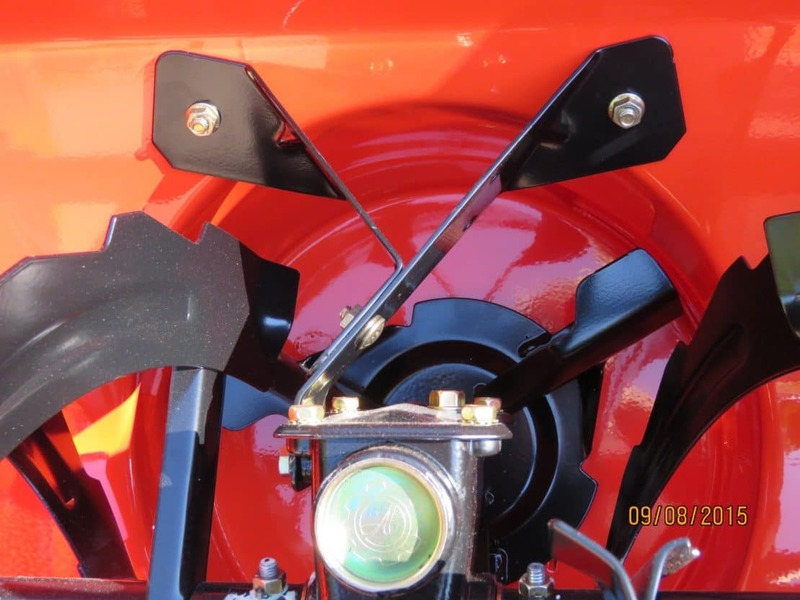 Ariens already had the open flight auger and added a new impeller that throws snow more efficiently. MTD (Cub Cadet) chose to keep the closed flight but turned the two interior screws (auger blades) 90 degrees and increased their speed 10 times. They also added a 4-blade impeller. Toro already had an efficient system. Which system is better? I haven’t had the chance to test them side-by-side. The Craftsman/Cub Cadet really works well in deep snow but doesn’t clean well when there is only 2-3 inches. They have very large engines for the size so they will take on the deep stuff well. I like the balance of the Craftsman Pro making it very easy to use. It can be hard to change the inner shear pin if it breaks. The Ariens may throw 10-14 inches of snow farther. It’s built to last a long, long, long, long time. The engine/size ratio is a little less than the Craftsman so it will take a few seconds 🙂 longer to clear your drive. The Ariens chute control while very robust – is not as ergonomic as the Craftsman/Cub Cadet. 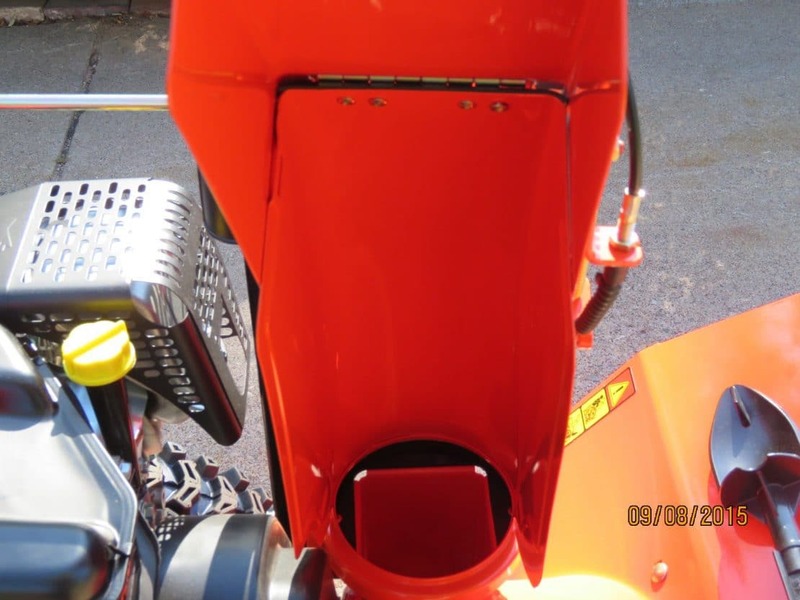 The Ariens is also nose-heavy compared to the Craftsman/Cub Cadet so if a smaller person is going to use it they will like Craftsman/Cub Cadet better. The Craftsman has in-home warranty repair and maintenance through Sears Repair Services. You can purchase an option Protection Plan that covers the defect warranty’s labor, trip charges and also covers most wear and tear like belts, shear pins and tires. You never have to take the snow blower anywhere to get it worked on. The optional Protection Plan is the best “extended warranty” in the industry because it covers so much more than any other plan. Finally, The handle bar height on the Craftsman/Cub Cadet is a little lower than the Ariens. If you are under 5′ 8″ you will like the Craftsman/Cub Cadet better. If you are over 6’2″ you will like the Ariens better. 2. Poly Skid Shoes. I found one on Amazon, but I wasn’t sure if it fit all Ariens machines or if there were different models. 3. Shear pins? Are they needed to have as spares. What model number of link? I am going to order the machine later this week. I can’t find Platinum Arien’s or the one I really want the Deluxe 28 SHO. I live at 7500 ft and need the power. HomeDepot out this way (Colorado) doesn’t carry these machines and will not order. If I go through a local or almost local dealer, approx. 100 miles away, they really run up the pricing tacking on shipping, assembly, etc. Snowblowersdirect seems like my only choice for a good deal. Watching Ariens and your videos makes it seem like I could easily set the machine up. Any opinions you can offer would be greatly appreciated. I worked with you last year and know Ariens is what I need. I couldn’t find an SHO so I didn’t buy. My luck may be running out with the snow forecast for this season! Money is a concern but quality is wanted. Hi John, Try Duffy’s Outdoor Power Equipment if he is within a reasonable distance. Otherwise go through Amazon: Ariens 921044 Deluxe 28 SHO 306cc 28 in. Snow Thrower with Electric Start . Pantano has an excellent reputation and their price includes shipping to your garage door. Thanks Paul. I have spoken with Howard at Pantano. Now I have to decide between the 921044 or the 921038. We live at 7500ft. I think the 306 would be big enough but the 369 would be better especially with the 24″ clearing path gathering less snow. We get huge drifts much higher than 21 inches so I have to work on them a bit. Are the controls that much better and convenient on the platinum 24 to warrant the additional $250+ cost (besides the larger engine)? I appreciate your input as I hope this will be my last snow blower purchase. Hi John, I look at the extra cost as $100 for the larger engine, $100 for the better chute controls and $50-80 for the hand warmers. The larger motor means you will never have to wait for the snow blower. So, the 306 will work, but the 369 will do better. The extra price is worth it if you want the easier chute, hand warmers and large motor. Spoke with the folks at Pantano, very helpful! I have to decide if the added cost for the Platinum 24″ (approx. $300) is worth the upgrade on engine size and conveniences. The added power is good for my elevation. The controls and handwarmers appear to be nice upgrades for the Platinum 24″. We have large, wet drifts and I have a 400+ ft driveway. I am older and the 24″ may be easier to handle for me and the engine. Do you feel that the cost is worth the reward? I hope to make this our last snowblower purchase. I am in the market to buy my first snowblower for my gravel driveway which is a U-Shape 75′ on each side and a 15×10 in the middle section By my garage. I am trying to decide between the Ariens 28 Deluxe SHO and the Ariens platinum 30. The 28 SHO is $100 cheaper and is available at my local dealer. The Platnium 30 is at Home Depot and is on sale for the same price as the Deluxe 30 which is a great deal. I live in New Brunswick Canada and last year we got dumped on with s total of over 14′ of snow with some storms dropping 1′ to 1.5′ of snow, This is not the norm but the last couple winters have been tough. Which model would you recommend or is there another model or brand that I should consider? Do you have any recomendations on how to alleviate damage to the chute do to the crushed gravel driveway? Hi Brad, You can wax the inside of the chute with a good polymer car wax for the first few years. After that a matching can of Rustoleum spray paint in the spring before you put it away for the summer will keep it from rusting. The chute itself is strong enough to handle 20 years of rocks. If you want the most power to throw snow as far away from your drive as possible the Ariens AX414 engine on the Platinum 30 is the strongest out there. The price on the Platinum 30 makes it really hard to resist. Thanks for the quick reply Paul. I just checked the website and the Platnium 30 was available earlier today but is now sold out. What about the Deluxe 30 vs 28 SHO? Hi Brad, For the amount of snow you get I would go with the Deluxe 28 SHO. More power……!!! Thanks for the great review, Paul. I’m feeling better about having purchased it! Could you say something about how the Auto-Turn feature works and if there are any problems with it? Thanks. Hi Sal, I have a video that explains the transmission and Auto-Turn Here: Ariens Platinum SHO 30 Inch A Look Inside . Simply, the Auto-Turn does not have any problems. It will last the life of the snow blower. That said, there are a few people who have had a hard time learning to use it and a few people don’t like it. It works very well on the Deluxe 28. It works best on the Platinum 30 with the poly skid shoes. When you are using it – guide it. It will go in a straight line. When you hit a crack in the concrete it may want to steer to the side where the crack was. Then just steer it back into a straight line. It’s very much like using a walk behind mower with front casters – or even a shopping cart. If you have ever used a mower with casters you know it takes a little while to get used to driving it, but it doesn’t take long to learn. I’ve been using the Auto Turn now for three years and for me it works well on blacktop, cement, gravel and turf. It even goes in a straight line on a sloped section of my gravel drive. Most people with issues have purchased one in a box or bought one taken out of the box by a stock person – not a mechanic. To check your unit to verify it’s adjusted correctly, Standing behind the unit slowly push down on the handles. Both corners of the front end should come up evenly. If one side comes up sooner than the other (say 1/2 inch off) Make sure you have the tire pressure the same in both tires. If the tire pressure is the same and one side still comes up early get vback to me and I’ll show you how to adjust it. Hi al, Thanks, almost done. Only 15 more picts to write about. I enjoyed the “picture review” format. Your camera shots were nice close-ups that allowed me to see exactly what you were referencing in the text. Paul, I have read your comments on the Husqvarna 300 series snow blowers and the ST327P is certainly being considered. However, the Ariens SHO models are also in my sight for a purchase. I like the Platinum 24 SHO since it has all the controls on the console which permit easier access for my wife to reach. In your opinion, is the Husqvarna ST327P built as well as the Ariens for the long haul? Ariens has been around a long time and getting parts is not an issue. I do like the hydrostatic drive on the Husky but your comments on the revised Arien’s disk-o-matic look like that too will be trouble free many years. I think the Ariens will blow the snow better also but so far that is not confirmed with any side by side comparison. It is just an observation from viewing YouTube videos on the Husky and Ariens.. Would really appreciate comments since both machines seem close. Husky includes a few items Ariens does not as well as the hydrostatic drive. Ariens offsets that with years of improvements and reliability. Do you have any idea how the forward and reverse speeds compare on the Ariens and Husky 327 model? Hi Dave, The Husqvarna speeds are as slow or fast as you want. In other words the hydro will let you creep along and the top speed is about 3 mph. Reverse is adjustable. If you back it up a long ways all the time you can adjust the reverse to go faster. Some owners state the 1st gear in the Ariens is too fast but I can’t say that myself. With a Platinum you will have enough power so even though 1st is a little to fast it will still be able to blast through the snow. The Husqvarna uses a 4 bladed cast iron impeller and the Ariens a 3 bladed steel. I don’t think you will be able to see a difference in how far they throw. I know with either one I can throw snow on the roof of my neighbors shed and that’s about 40 feet away. I should have a picture review done of the ST327 in the next few days so then you can see th differences in the build quality yourself. Thank you for doing these great write up’s! So from reading you post is it fair to say you feel the quality of the Ariens may be slightly better than the Husqvarna? Maybe I’m reading into it too much? What are the odds since you have both machines, and there seems to be a buzz online about these new 300 series Husqvarna online, could you do a competitive comparison review? Love the new format by the way. I just think since they are side by side a photo comparison review would help many. I am looking at both machines myself and will be purchasing a Deluxe or Platinum 24, Husqvarna ST324P or a Toro 826OXE HD. They all will do the job but all have a short coming. It’s just what one can I live with. That’s why this comparison would be so helpful. The Husqvarna appears to have great components, engine, trans, impeller etc but the question for everyone I read online is quality, is it built as well or is it cheaper and lighter built, metal, bearings, gearbox etc. Toro appears proven but new engines, all the plastic, aluminum gear case, no gear case support, etc make me worry. I have a dealer that ordered Toro’s old stock so he will have this machine with the Biggs any day so that may be better. Ariens looks very good. I really only see one drawback, auto turn. The ridged metal plates slipping over each other look like the would wear our.people post the machine try’s to turn when encountering packed snow. Just looks like something that will make the machine a challenge to fight down the driveway. Otherwise I like what I see. Thanks again for you time and consideration. I appreciate any thoughts or future reviews. P.S. I have a dealer that has the Ariens, Toro with a Briggs will be here any day and same with the 300 Husqvarna. Once they are here, hopefully this week I’m pulling the trigger. Hi JB, I get really nervous when I hear about a dealer that sticks with what’s familiar instead of going with what’s best for his customers. The “new” Toro engine is a premium engine and it is one of the best snow blower engine ever offered. I strongly suggest if you want a Toro to find another dealer. A few other facts to help you decide. The Auto-turn doesn’t work by slipping the plates. There are springs inside the unit that release the plates when you make a turn. The design has thousands of hours of prove-design and destruction testing on it and I expect it to last just as long as the rest of the components in the transmission. The Toro front gearbox does not need a support because they use a full length shaft inside the augers. The end of the shafts are supported on the outside with bearings in the housing. The augers are supported their entire length by the inner shaft. The other brands use a short output shaft from the auger gearbox and the hollow augers then have bearings at the housing. I have yet to find anyone who has tore up the front gearbox on the HD Toro’s. It is so strong they don’t use shear pins. When reading reviews of the Husqvarna make sure you are reading reviews of the 300 series. If the review is over 2 years old it does not apply. Last year many people in the Boston area purchased the 200 series and then overworked them on the 6 feet – 24 inches at a time – of snow they got. The 200 series is a good machine but designed for winters like we get in the Midwest. Husqvarna has addressed and fixed all the complaints owners had with the old Crown series. Finally, all the plastic on the Toro. The plastic is not a material like plexi-glass or fiberglass that hardens or gets brittle over time. This poly material is specifically designed to handle our winters and never crack or break. It is durable down to minus 104 degrees and guaranteed for life. I know one Toro dealer who has sold hundreds of these snow blowers every year for the last 15 years and he has yet to warranty one piece of the sub-zero material. Thanks for posting another excellent review with great photos. This Deluxe 28 SHO is a really nice machine. For the extra $100 over a regular Deluxe 28 it represents a great vale you are getting 2.5 more foot lbs. of torque, the higher speed SHO impeller, belts and pulleys seems like a no brainer.